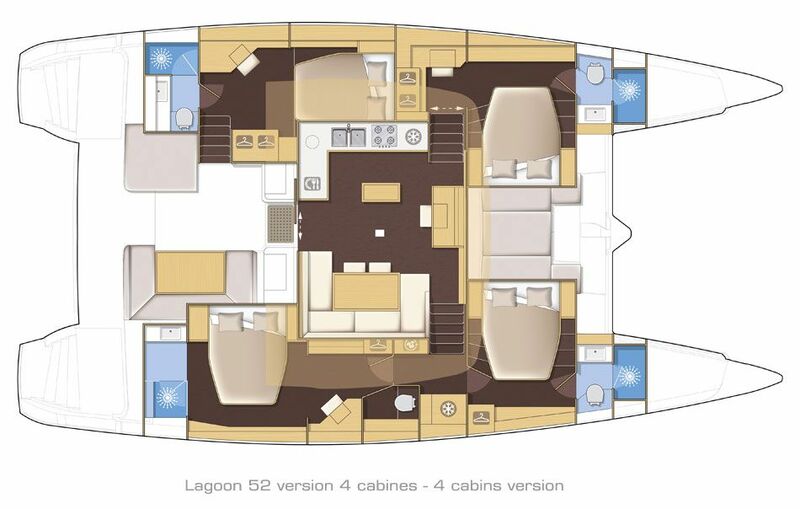 The Lagoon 52 is part of the new family of Lagoons that are strong, good looking and powerful performers. 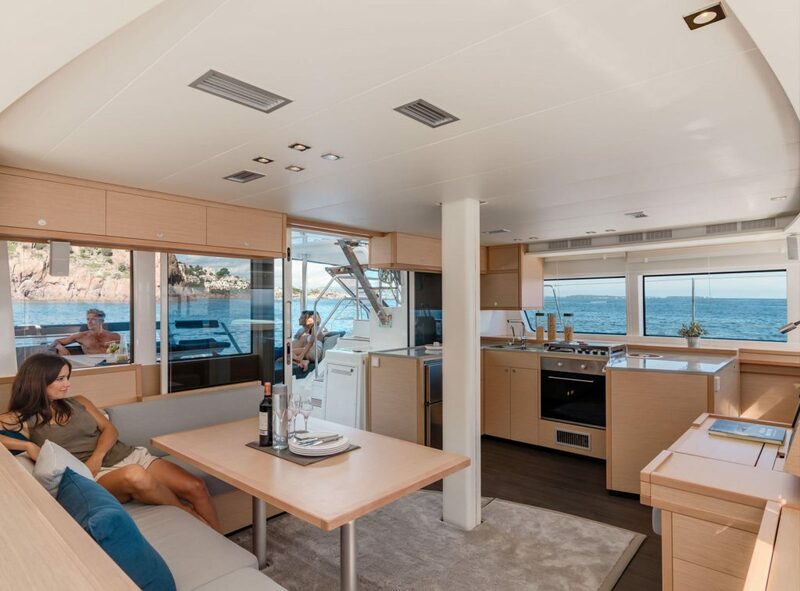 She is the product of the winning combination of leading architects at VPLP, the Italian Nauta Design agency and the Lagoon design department. Imposing yet versatile, this 52 foot cat has impressive levels of comfort, space and innovation. 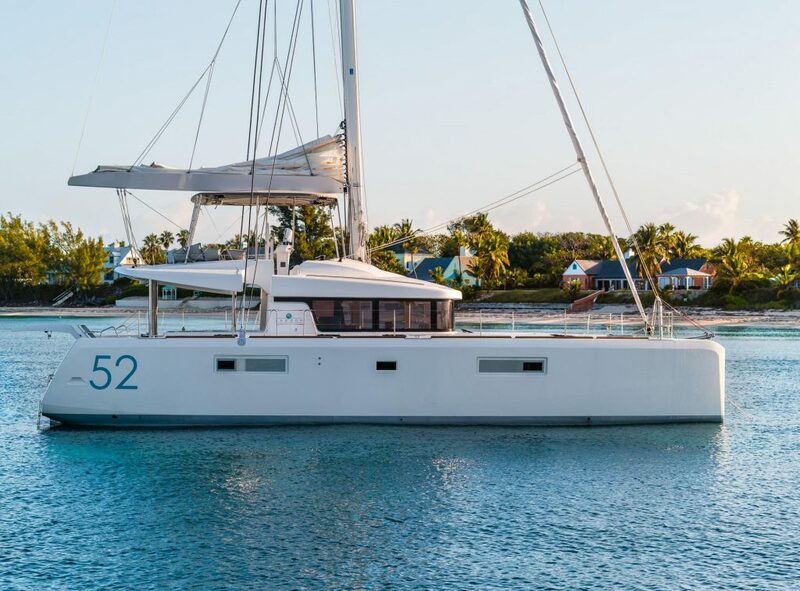 She encapsulates the core tenets of Lagoon in terms of elegance, optimal use of space, and ease of handling and performance under sail. 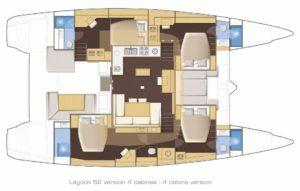 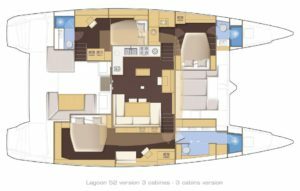 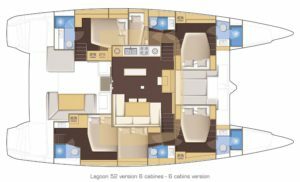 If you would like to find out more or buy a Lagoon 52 Fly contact us here, or email Robin Hodges, our yacht sales manager. 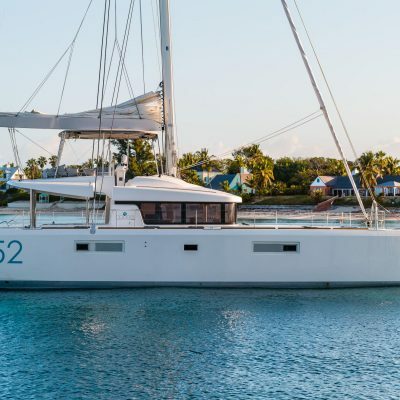 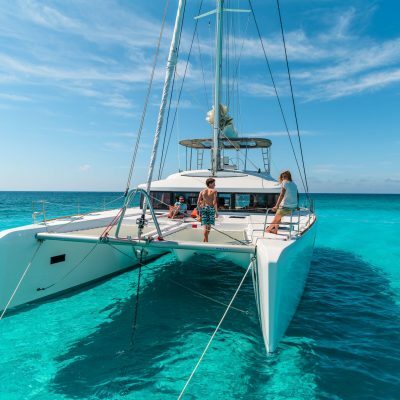 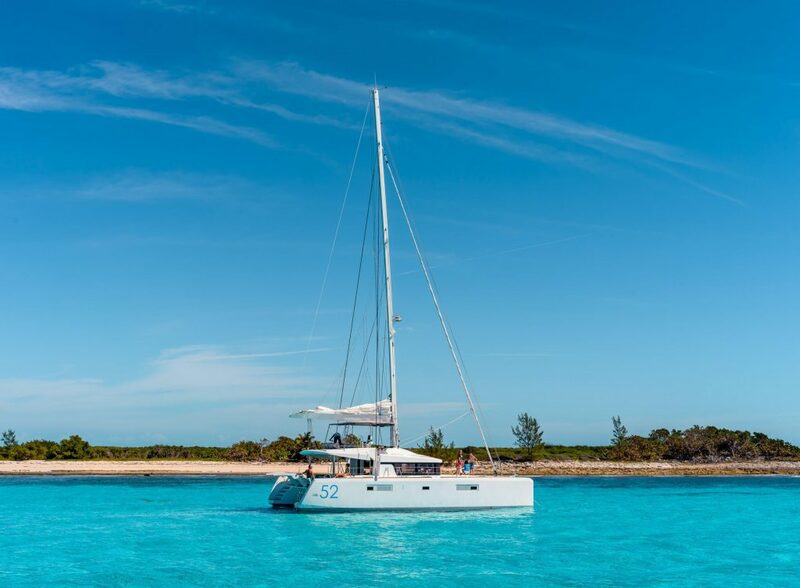 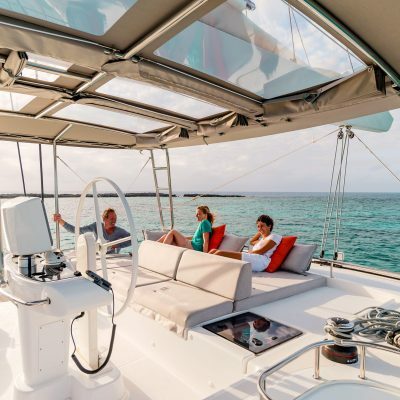 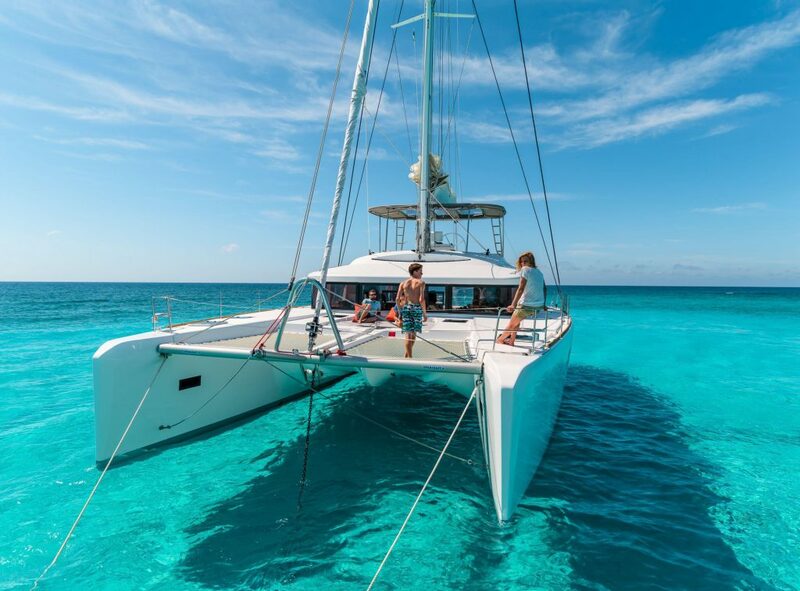 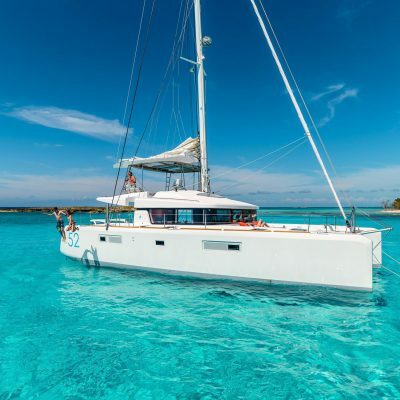 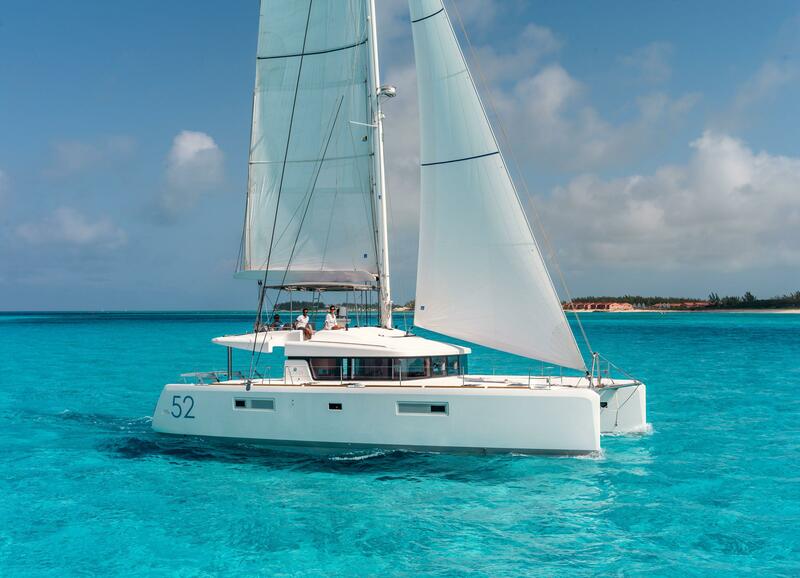 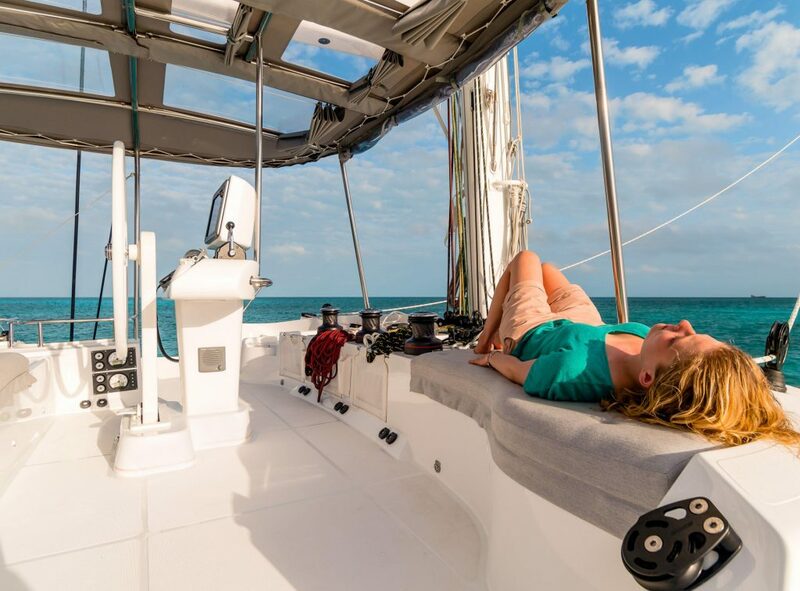 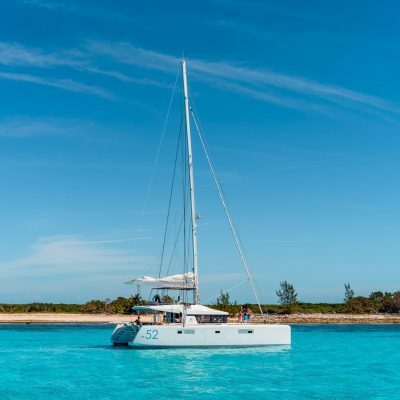 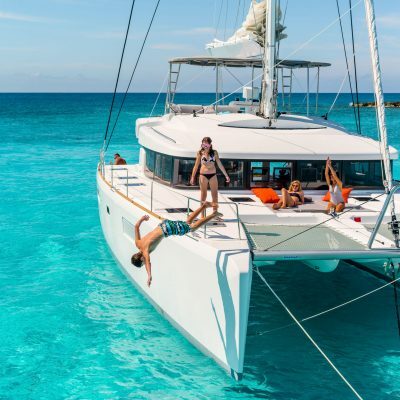 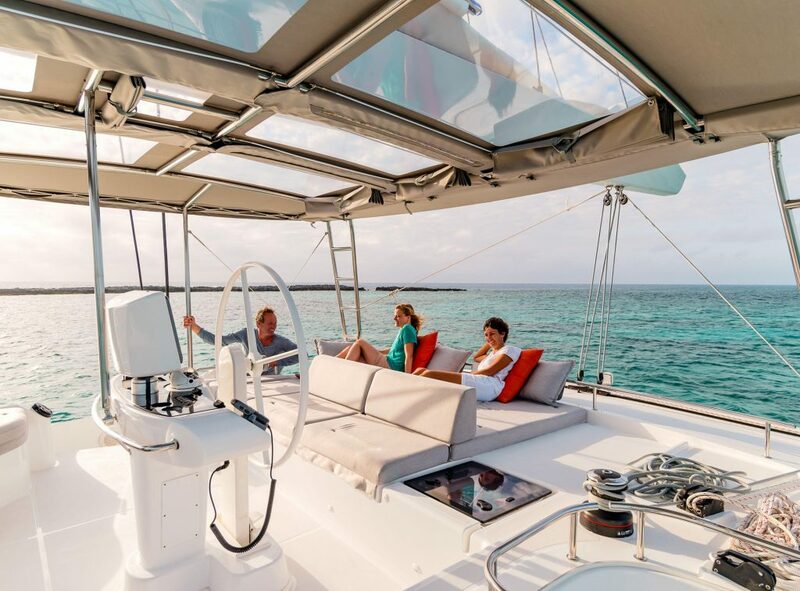 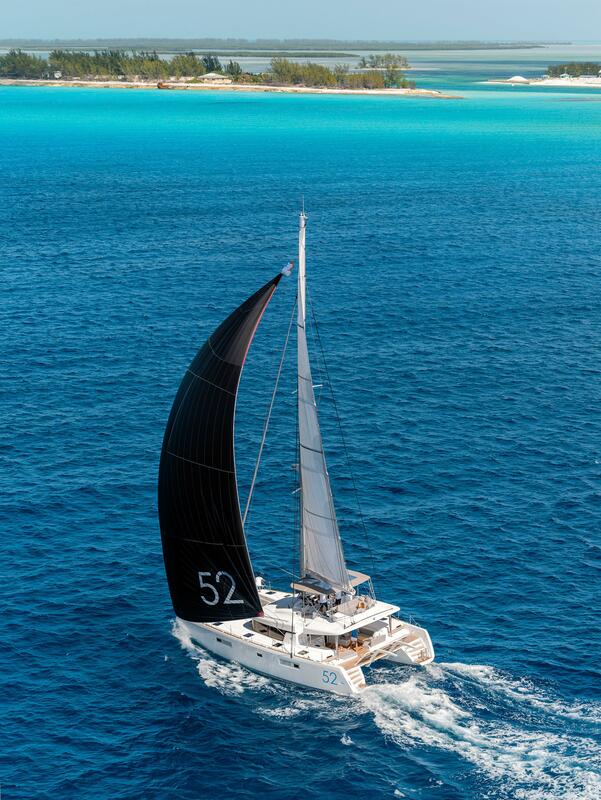 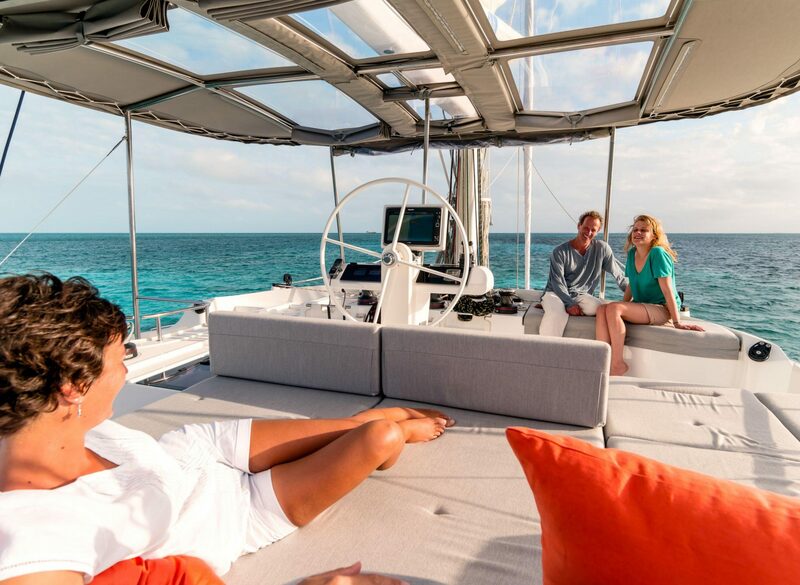 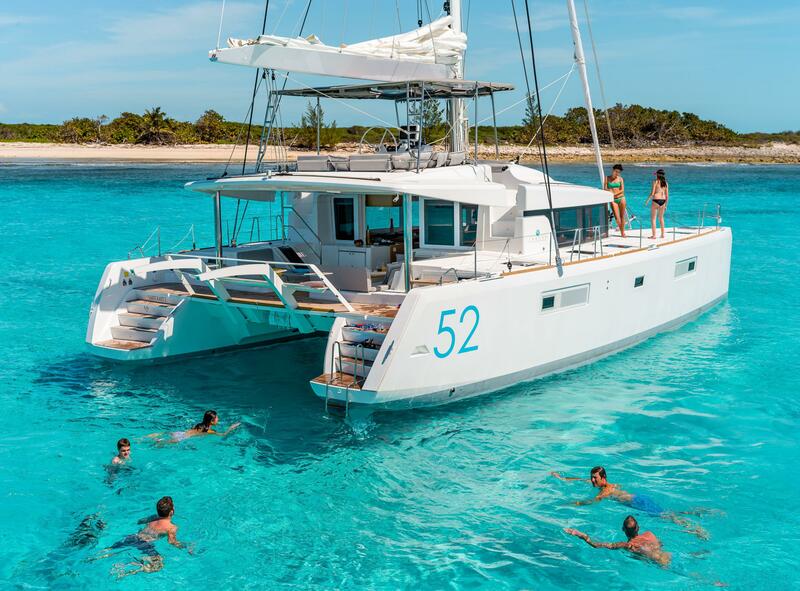 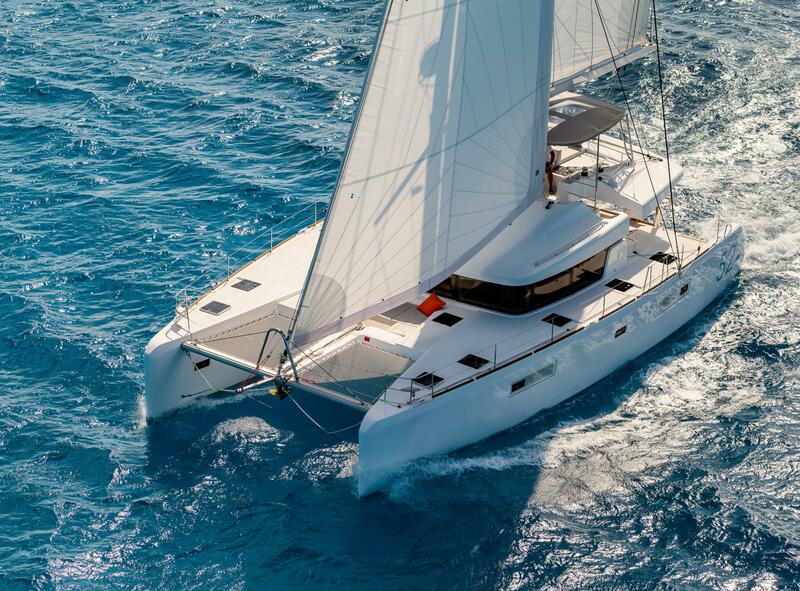 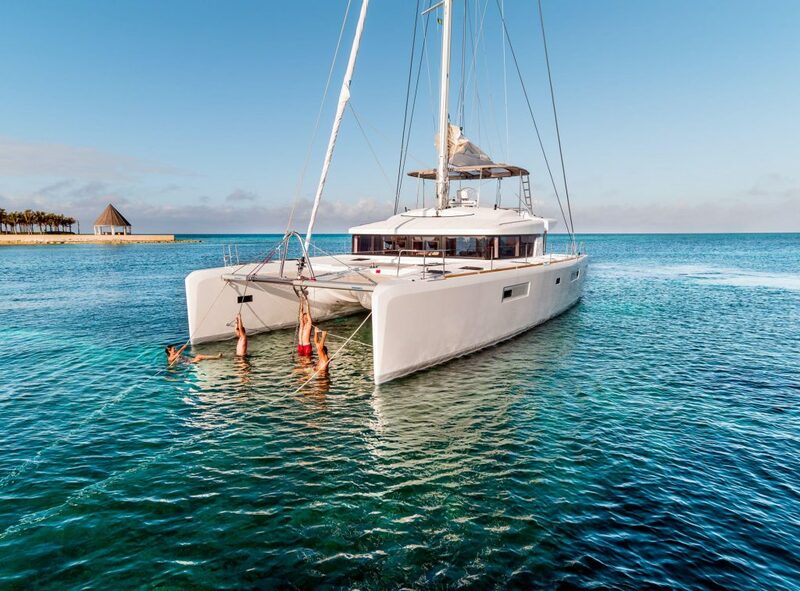 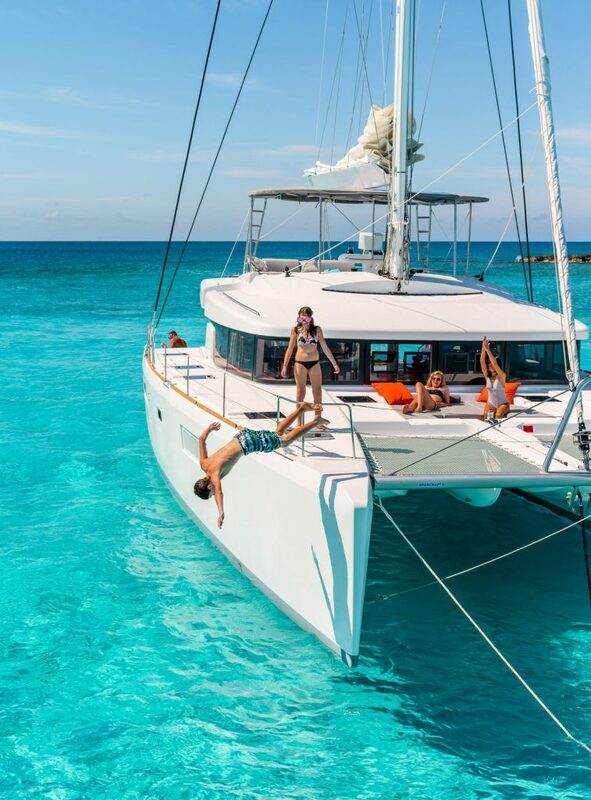 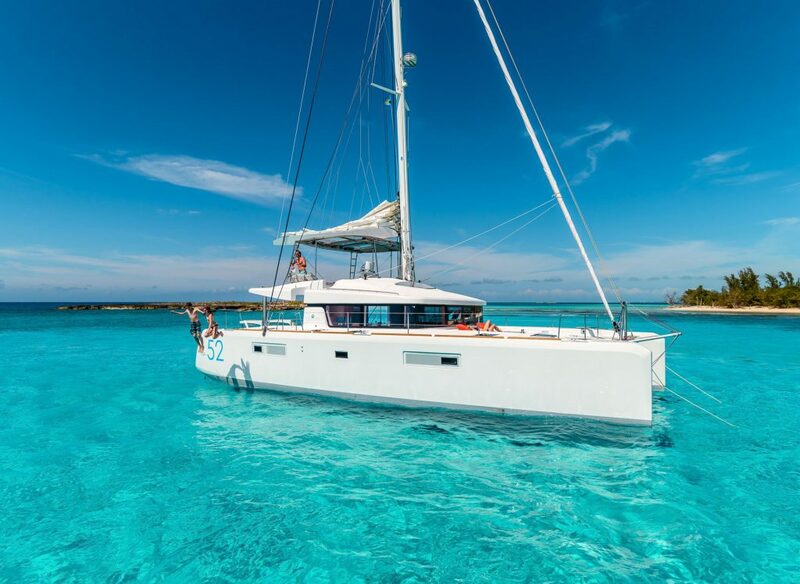 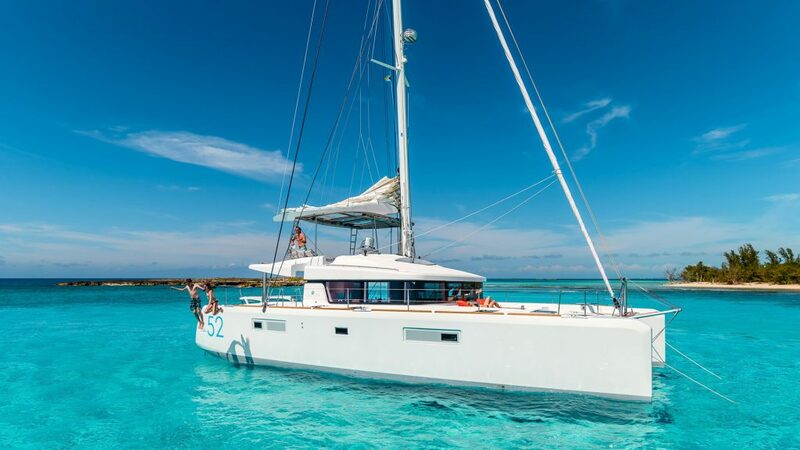 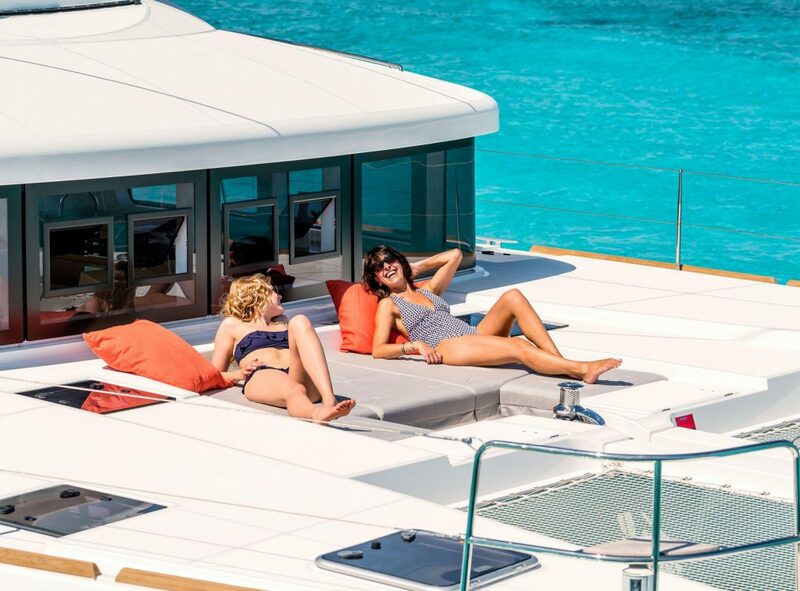 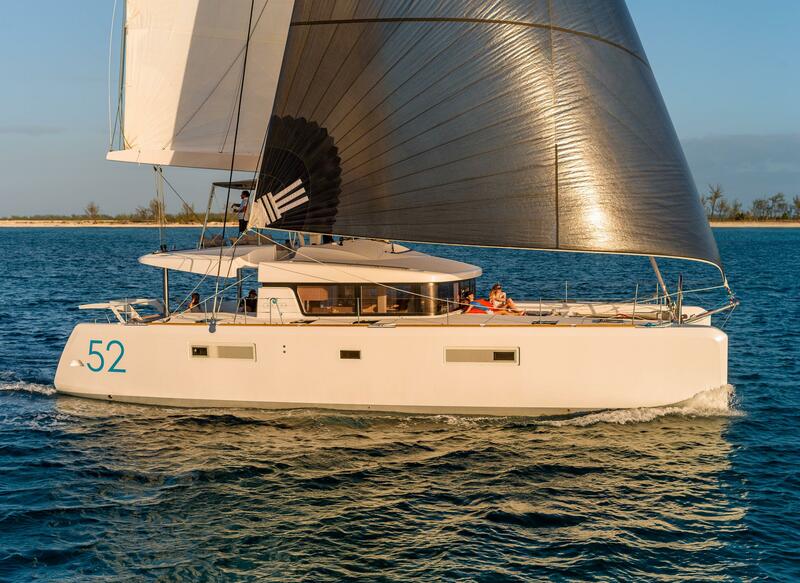 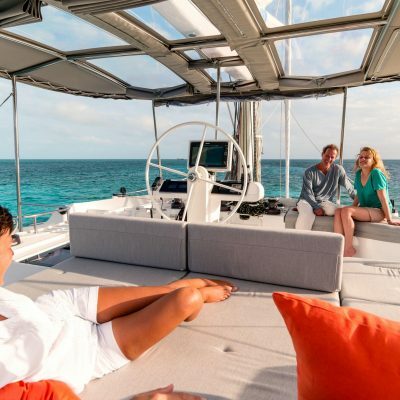 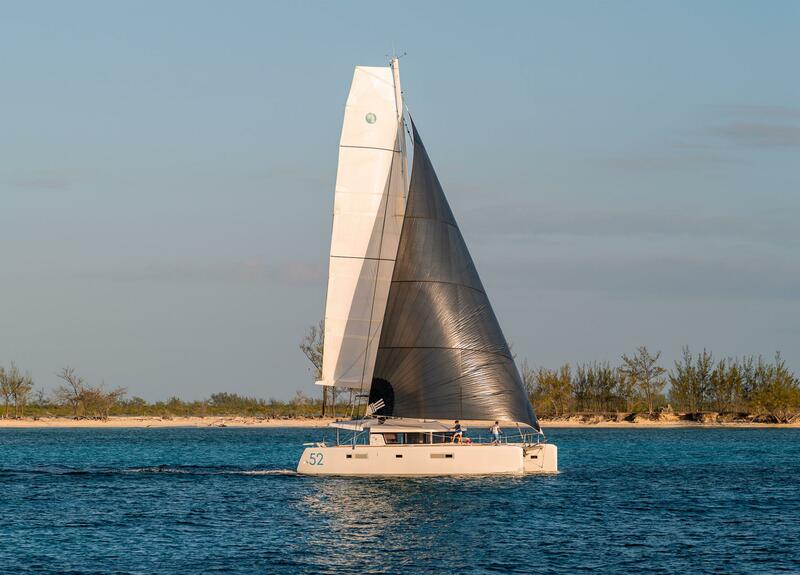 robin@horizonyachtcharters.com Please scroll down to read more about this marvelous catamaran. 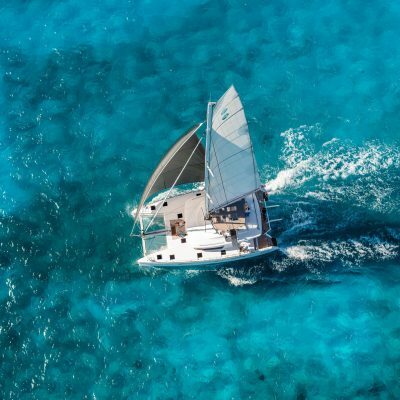 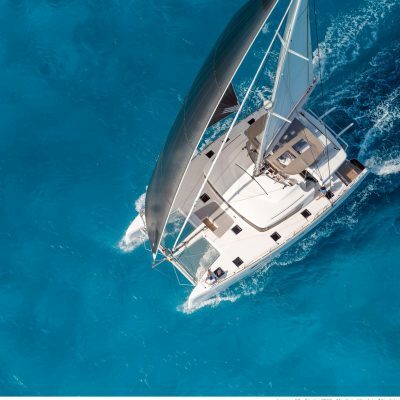 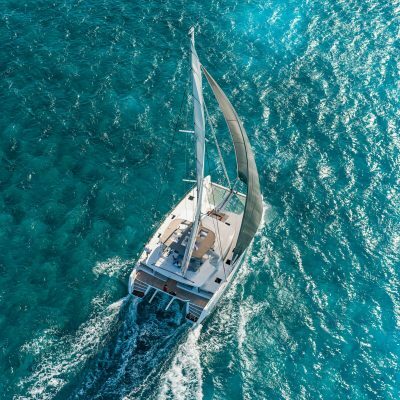 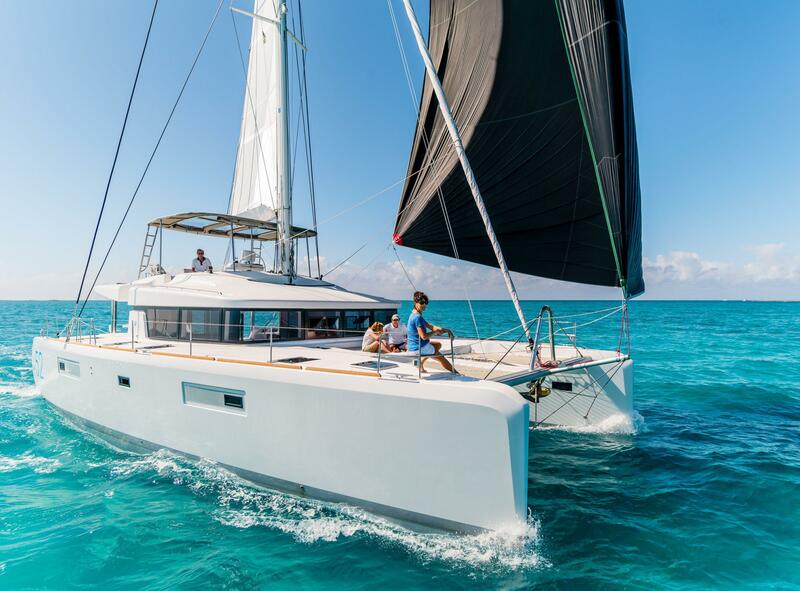 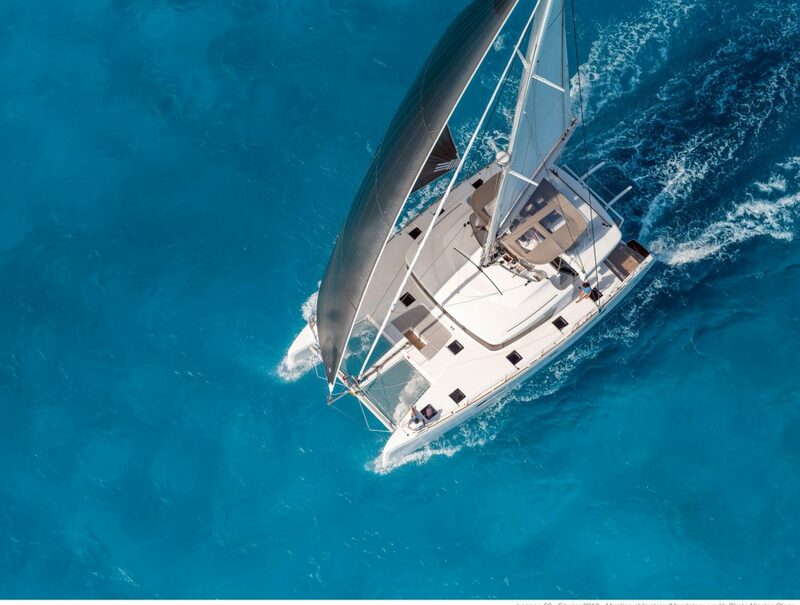 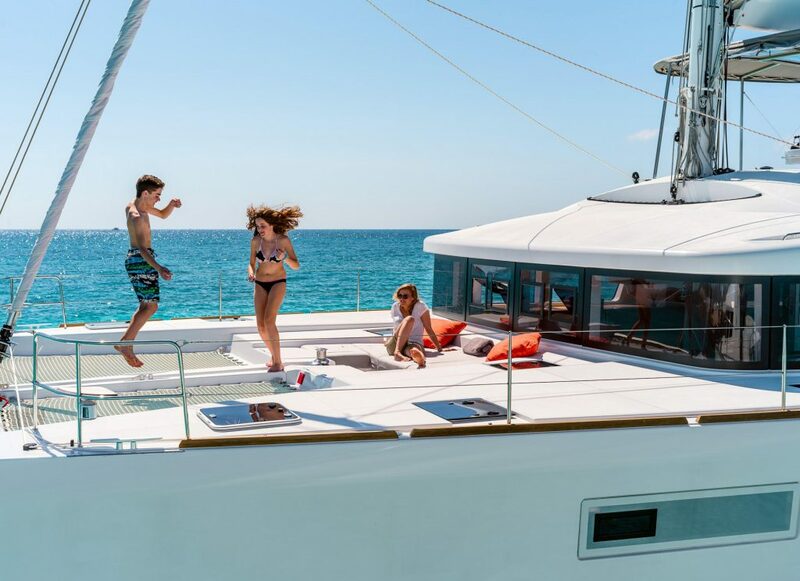 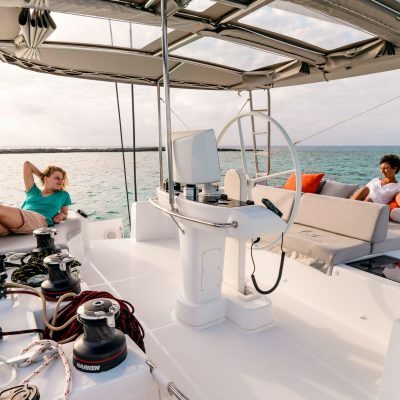 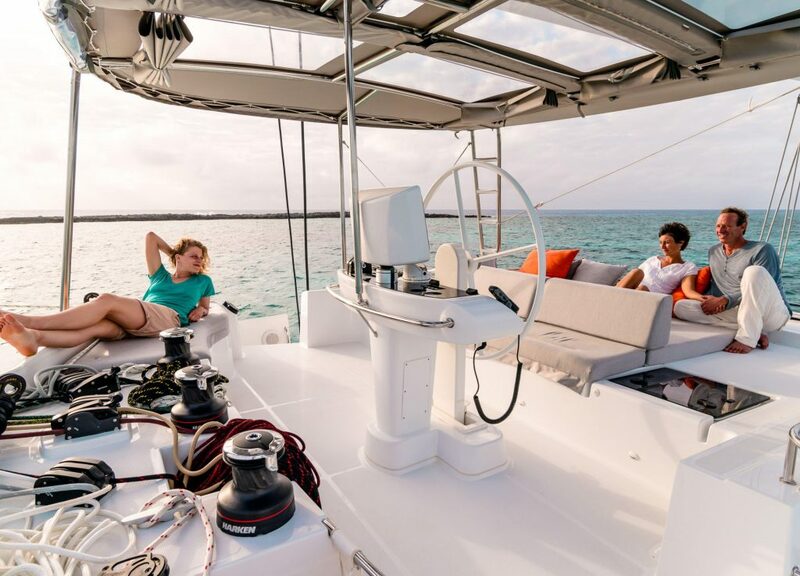 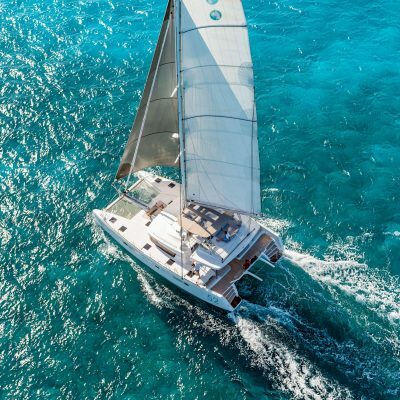 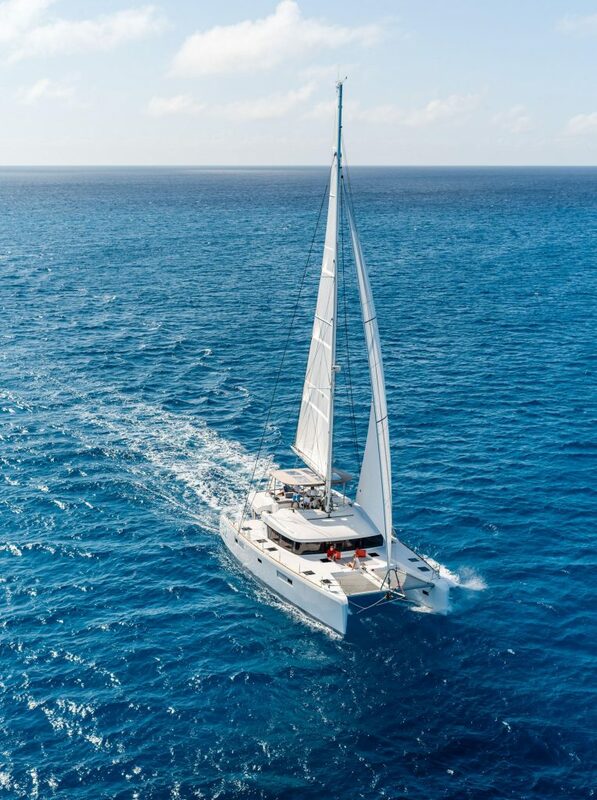 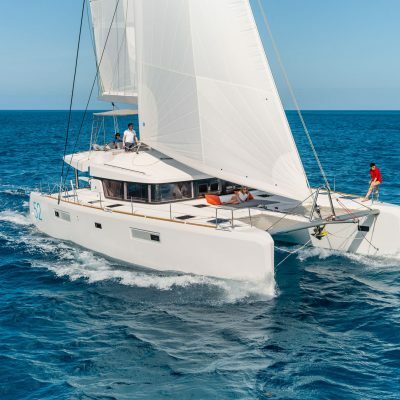 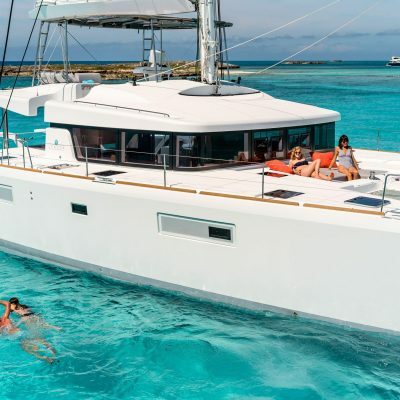 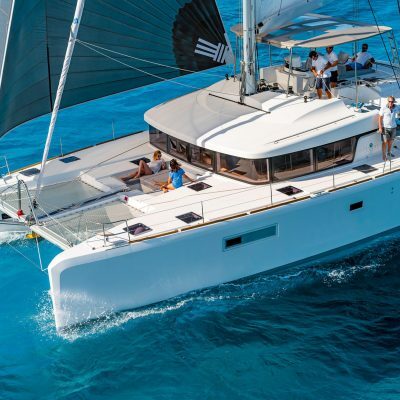 She is a big boat and the deck space is vast, but the advanced sail plan and upgraded hull construction means performance is not compromised by size. 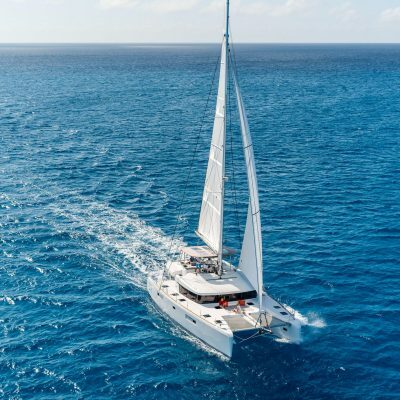 The mast, in common with all newer Lagoons is set aft with a high aspect slightly smaller mainsail, and bigger foresail. 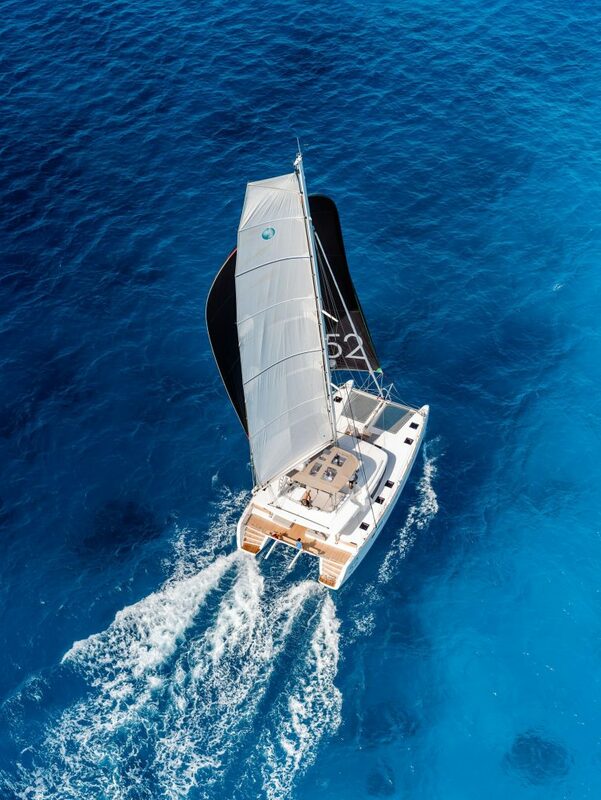 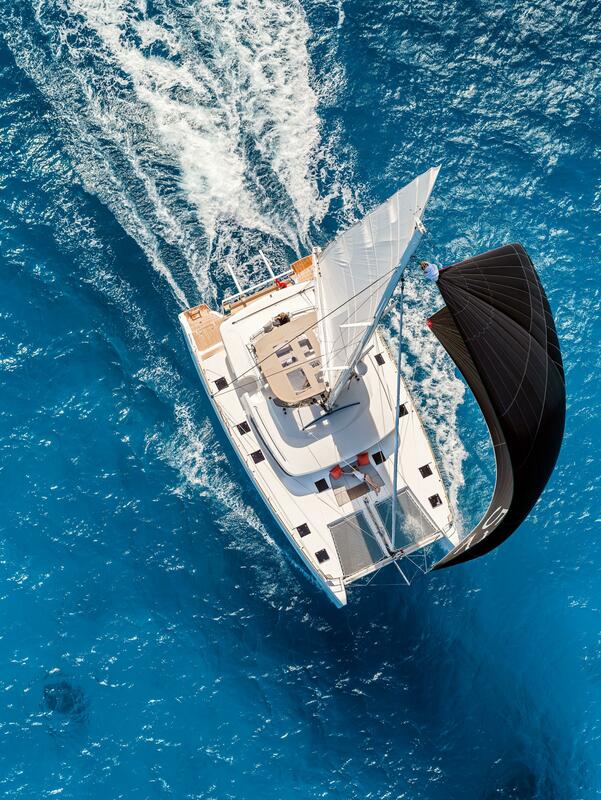 The foresail is self tacking and adds to the ease of handling this big cat. 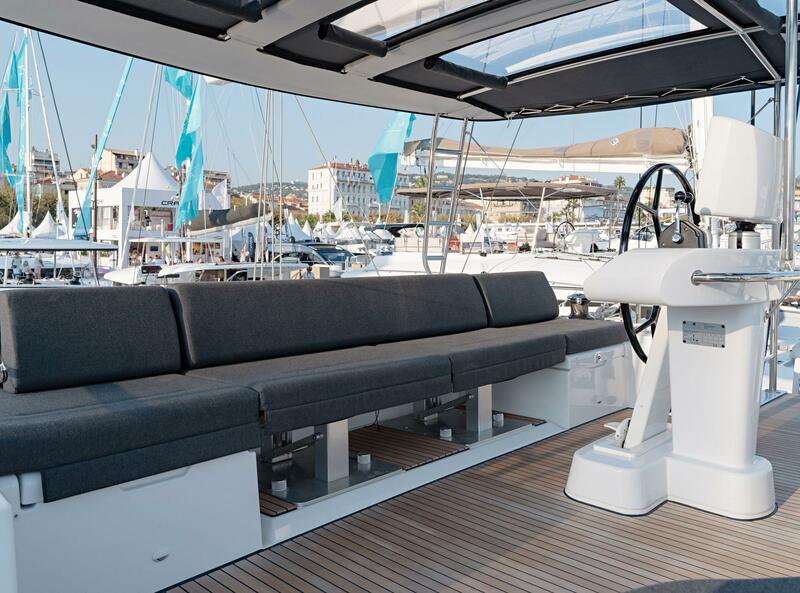 All control lines are led to electric winches at the center of the boat just in front of the helm, with good line storage bins to keep the area clear. 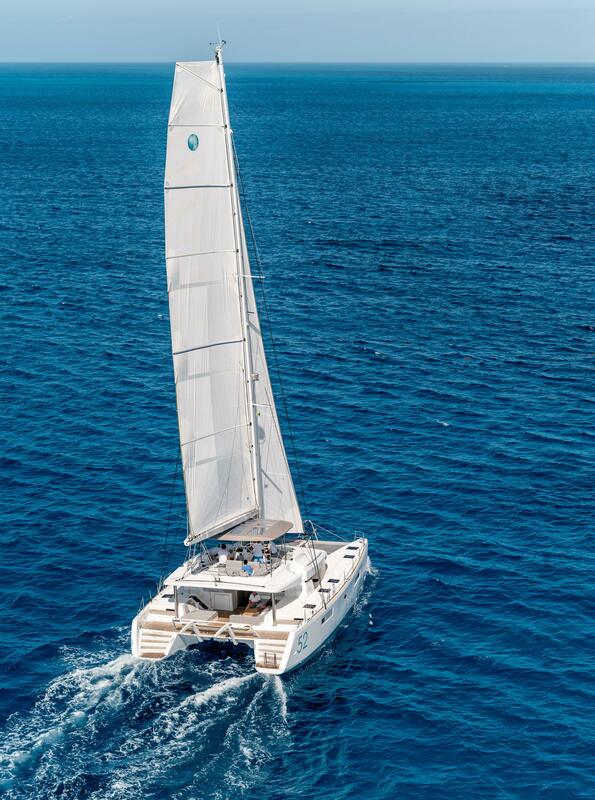 The helm itself is ingenious and cants to port and starboard giving optimum visibility on both tacks. The vast fly-bridge, accessed easily from both side-decks, seats 6-8 easily and there are expansive sun-loungers on the aft cockpit roof for lazing and soaking up the sun. 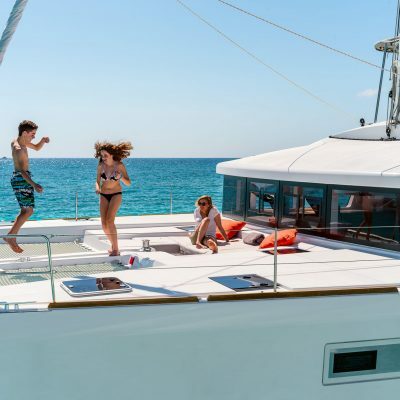 For sun-lovers there is also copious lounge space forward and large trampoline to lie back on. 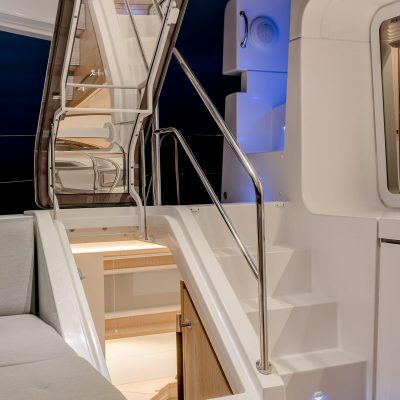 The wide aft cockpit is impressive with plenty of seating for relaxing and space for entertaining. 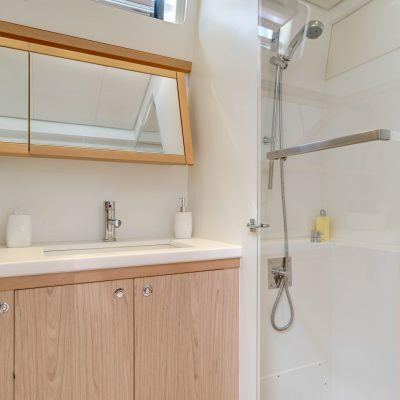 There is also a sink, a fridge and the locker space is immense. 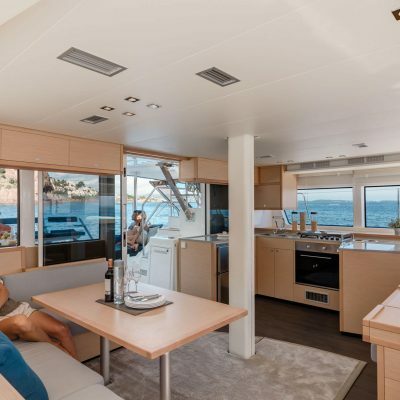 The saloon door and the connecting window open wide to provide a large single level living area with easy traffic flow. 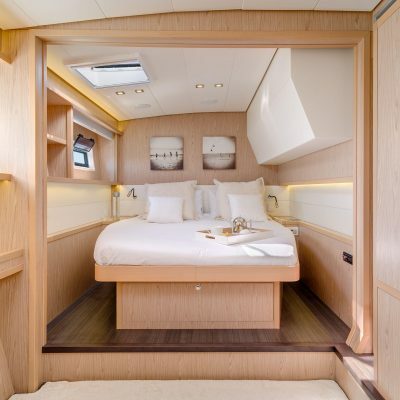 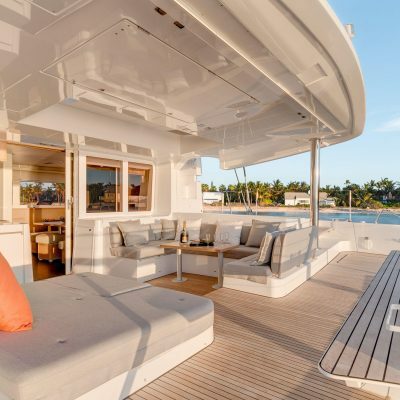 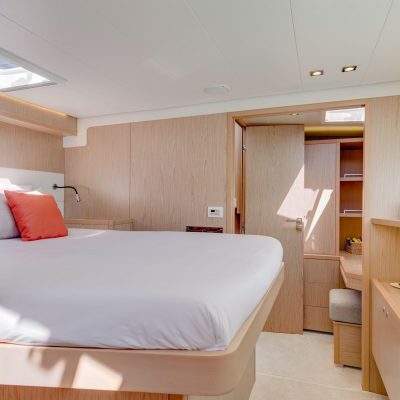 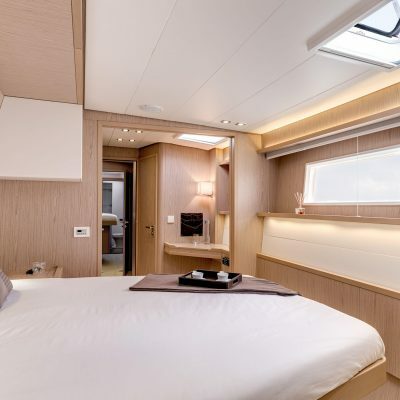 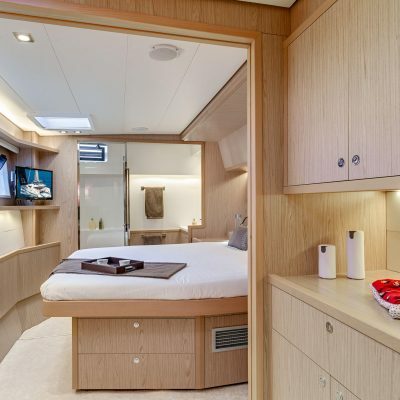 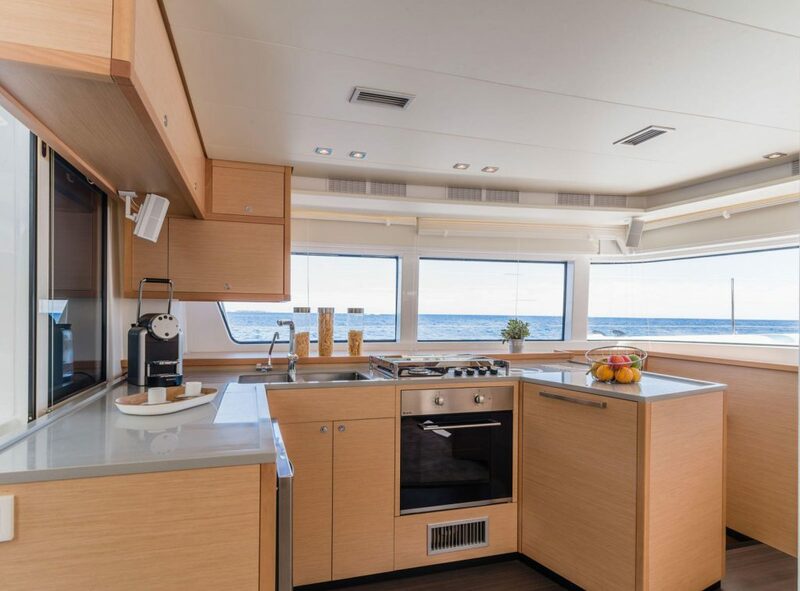 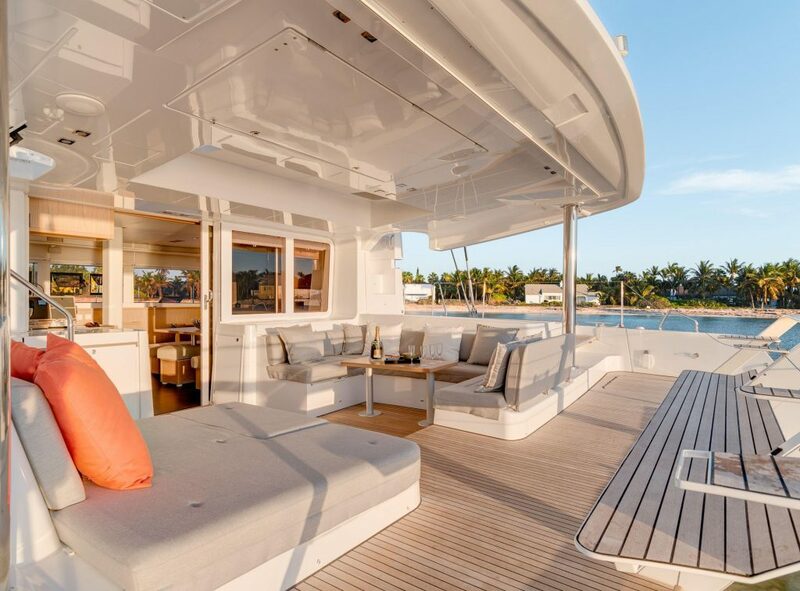 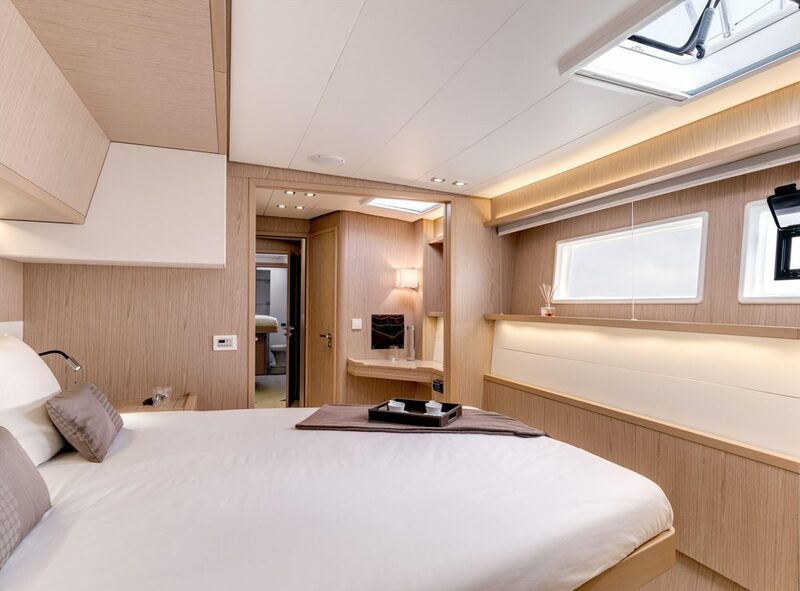 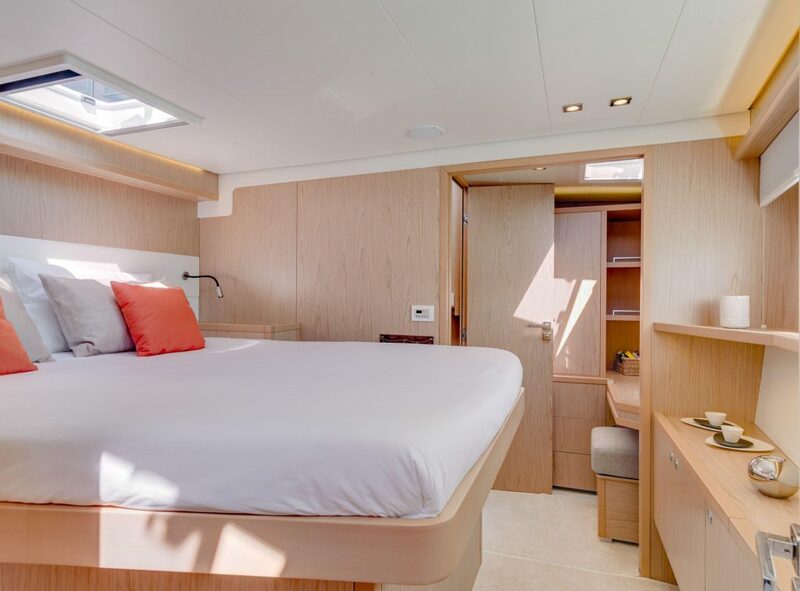 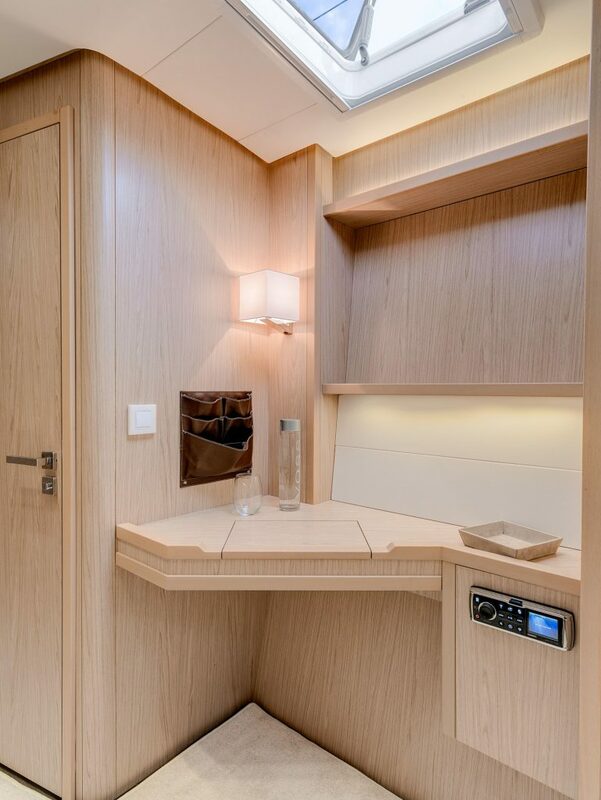 An interesting feature on the Owner version is the direct opening access to the luxurious aft port cabin which gives the owner a private entrance. 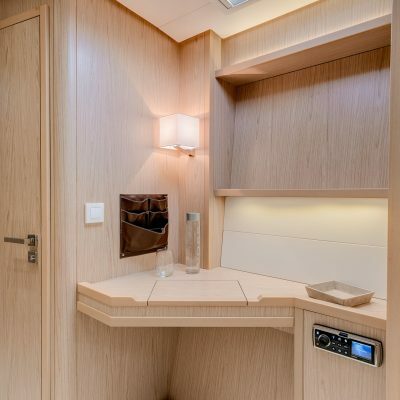 The saloon is inviting, warm, and at the same time functional. 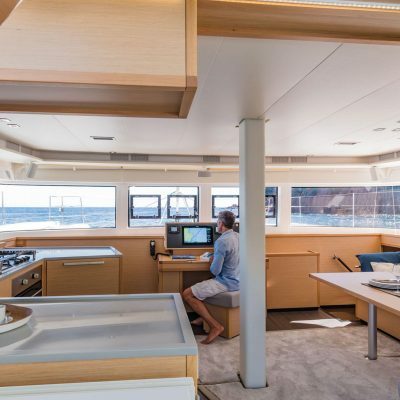 It encompasses open seating and a dining table to starboard and a large L shaped galley. 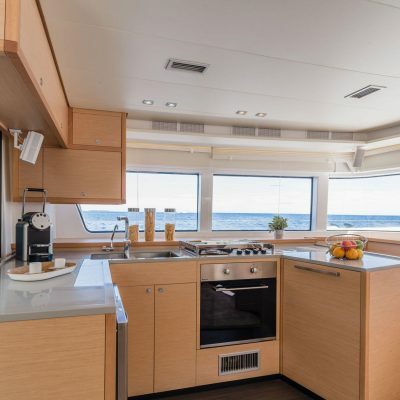 There is good storage and counter space and a central island that enhances both. 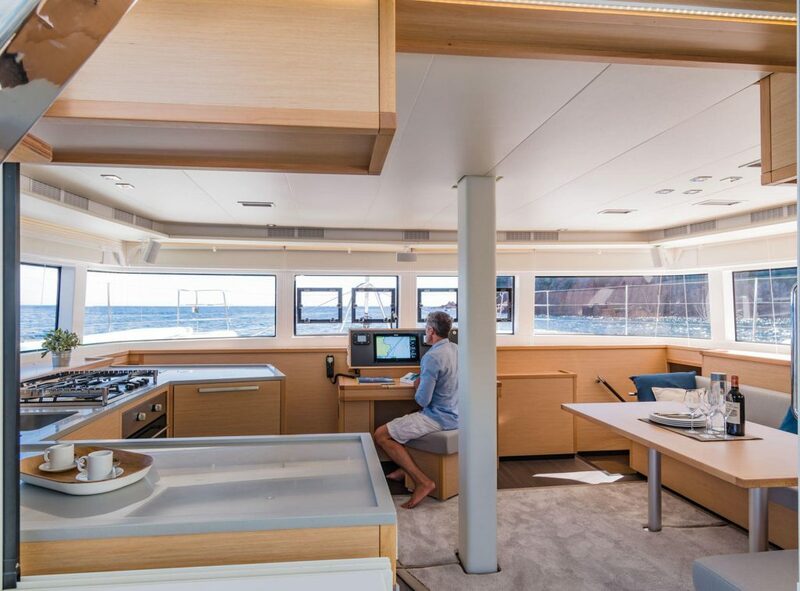 The Lagoon signature curved vertical windows allow masses of natural light to flood in, and great visibility looking out, whether sitting or standing. 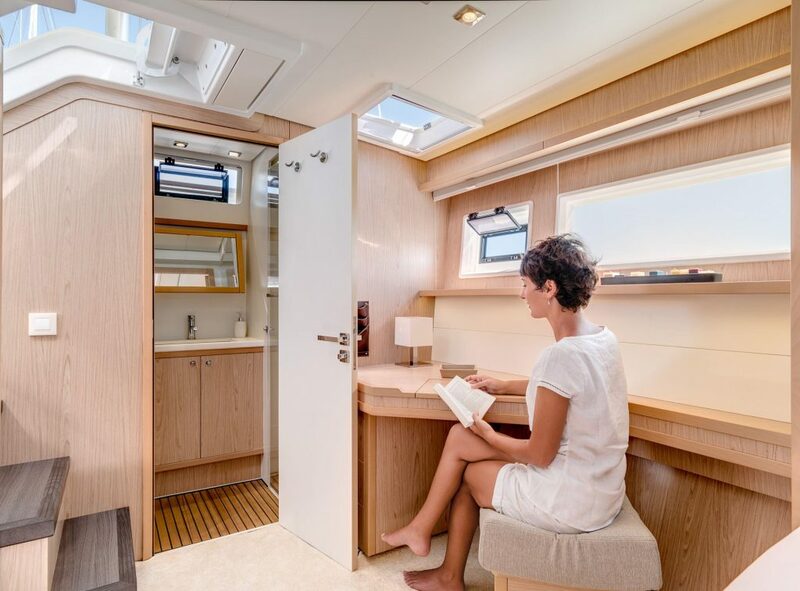 The vertical glazing offers better protection against the sun, increases the saloon space and maximizes headroom. 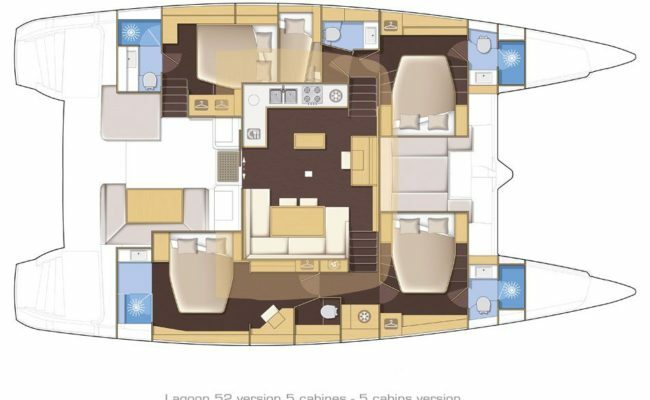 Four opening windows forward allow ample ventilation. 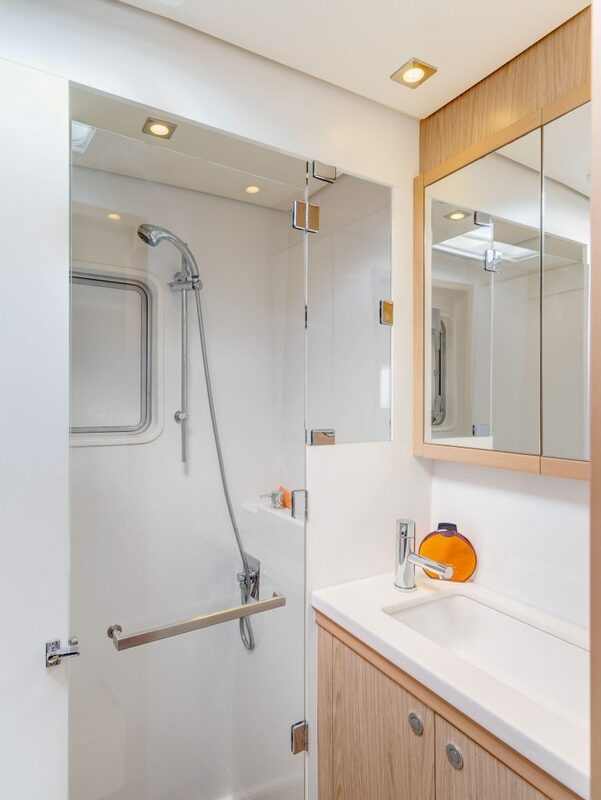 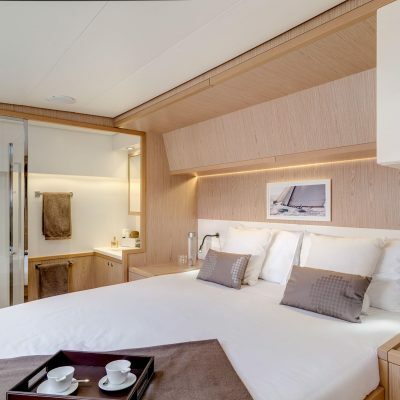 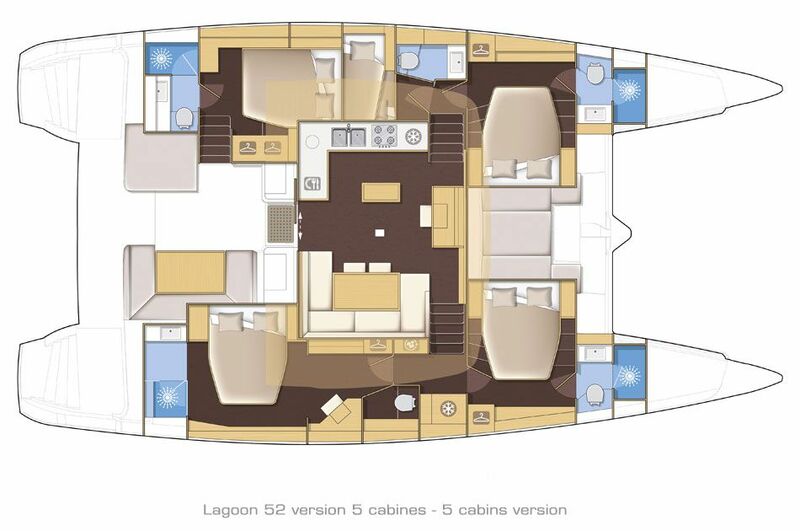 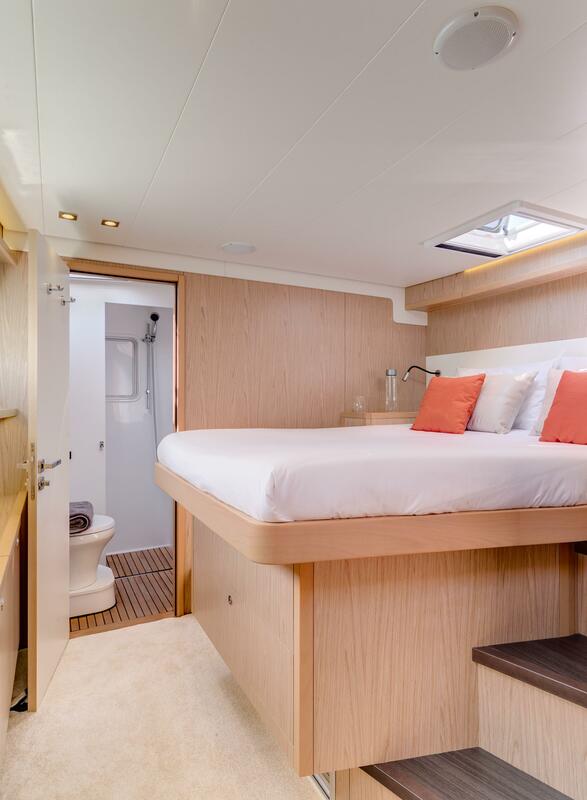 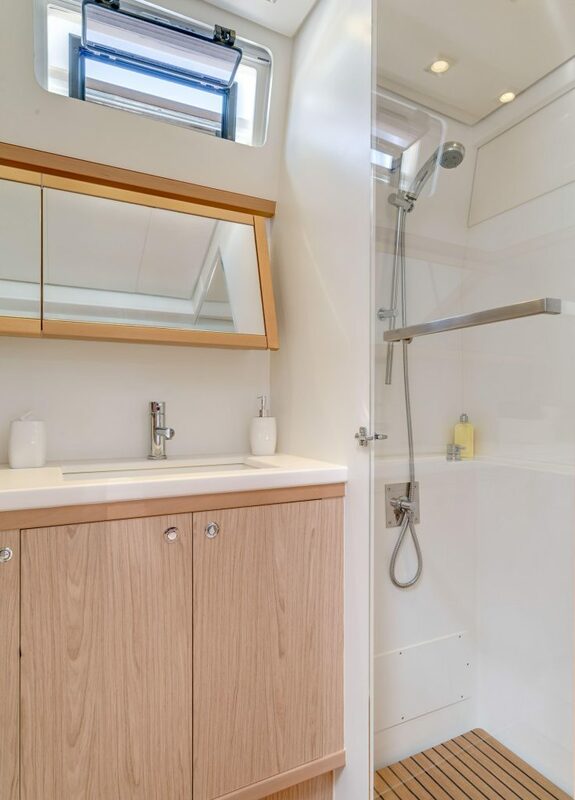 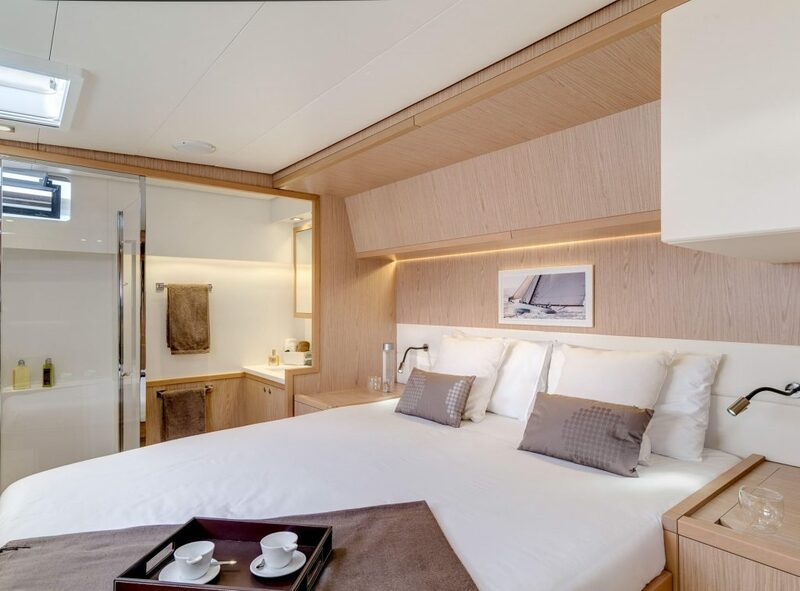 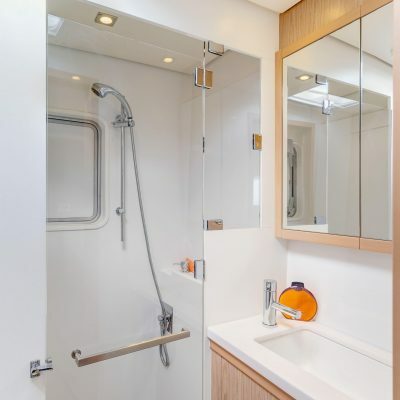 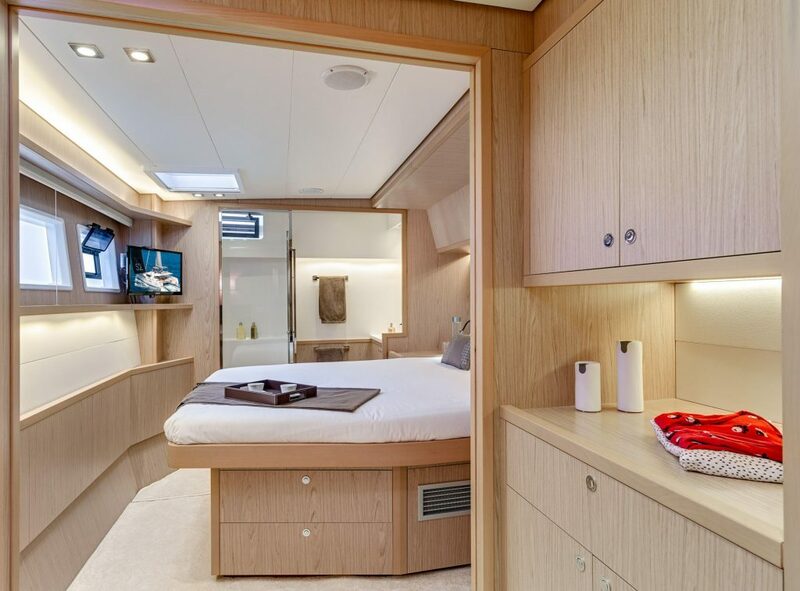 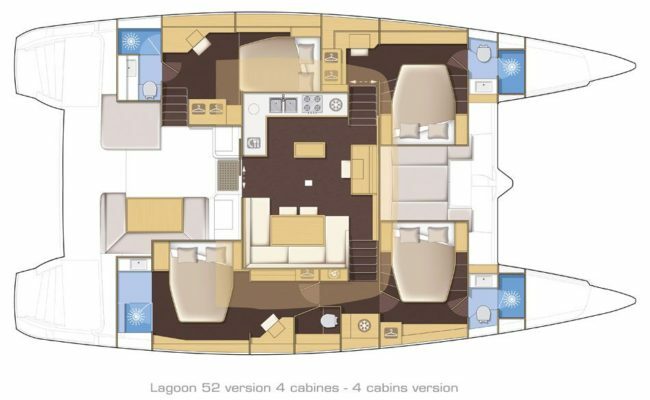 There are multiple internal layouts available, with 3, 4 or 5 cabins and 3, 4 or 5 bathrooms. 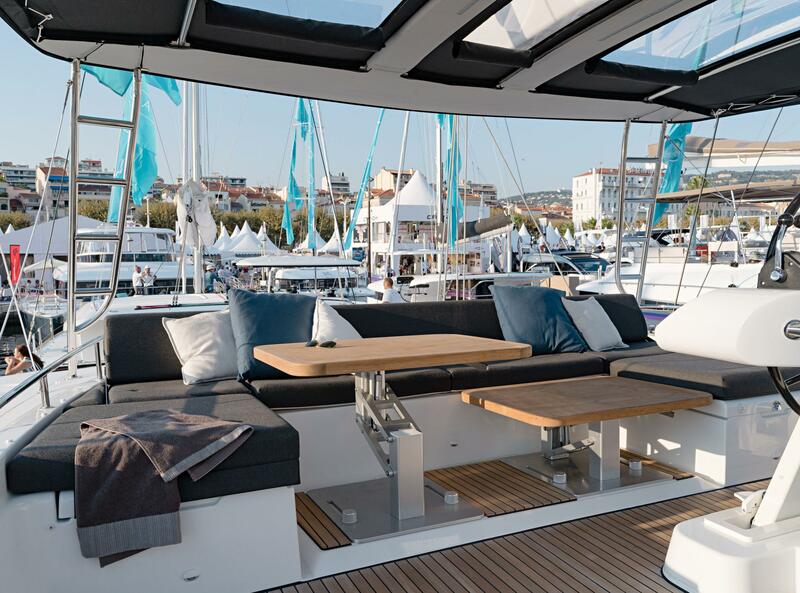 No matter which you the select the interior furnishings combine lavish comfort and stylish design. 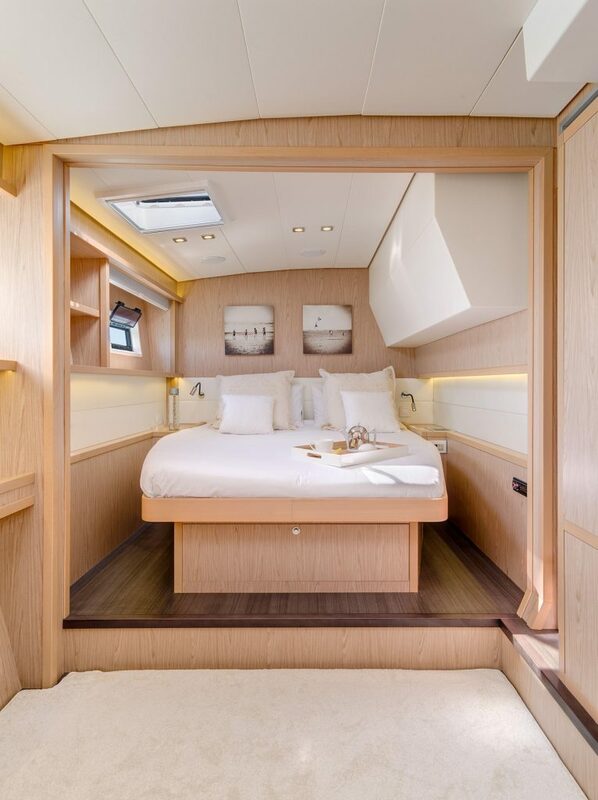 The beds are large and storage is generous. 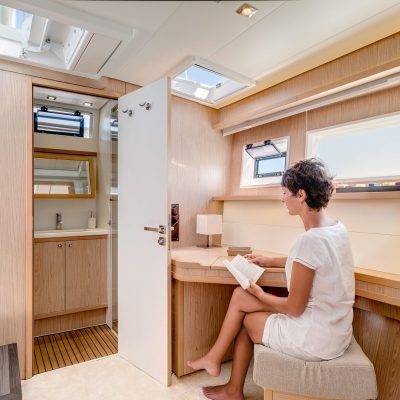 There is great natural light and ventilation thanks to huge port-lights and flush hatches. 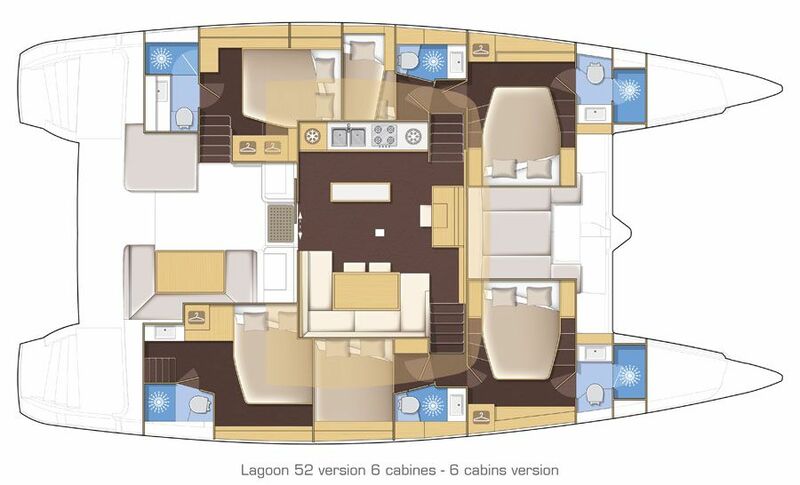 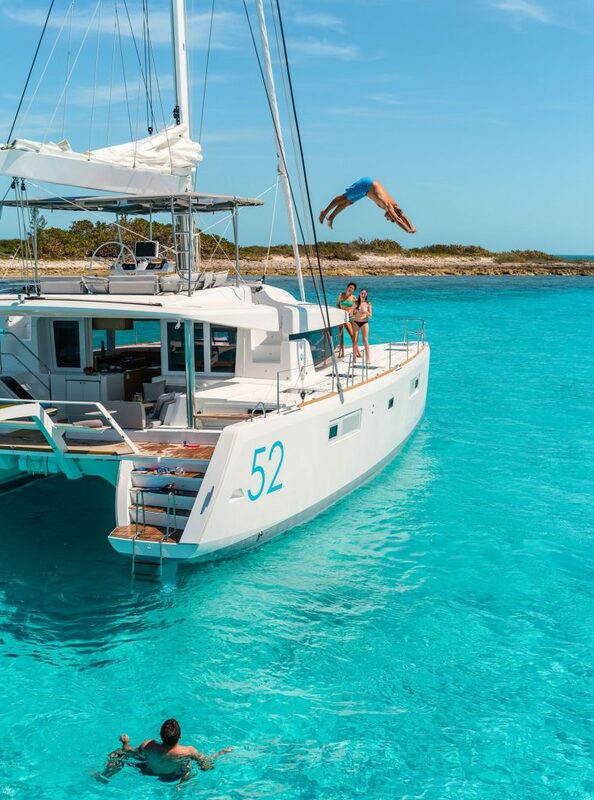 Although the Lagoon 52 is a large boat she is definitely accessible and welcoming. 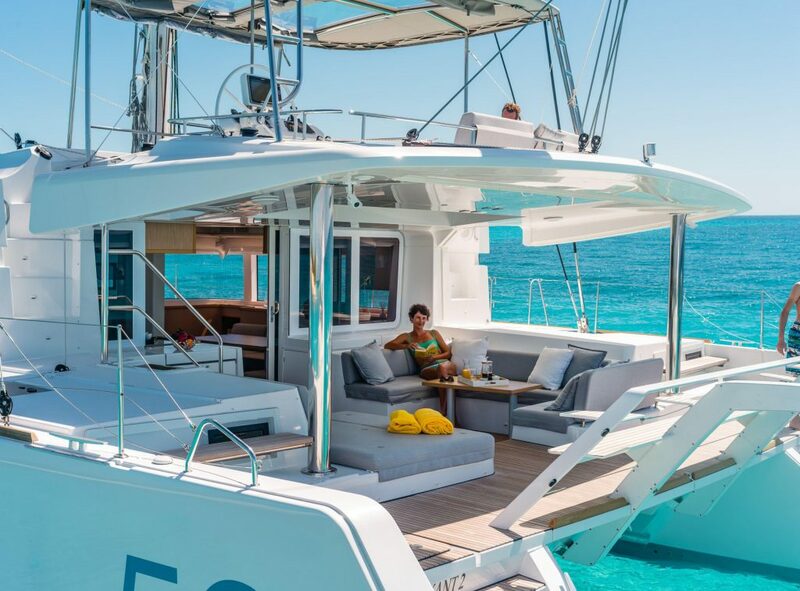 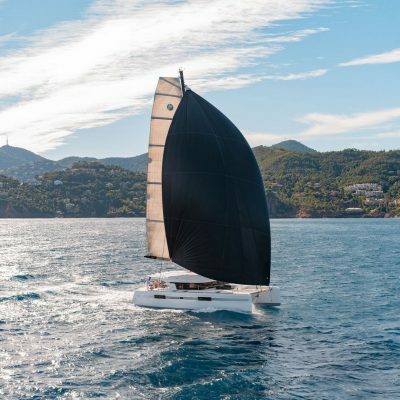 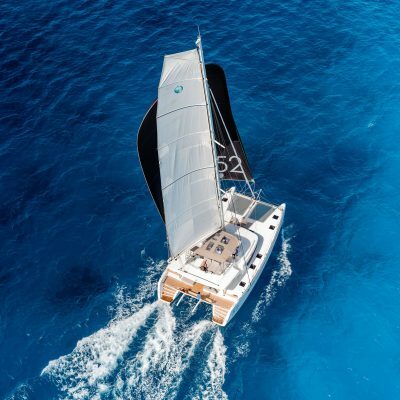 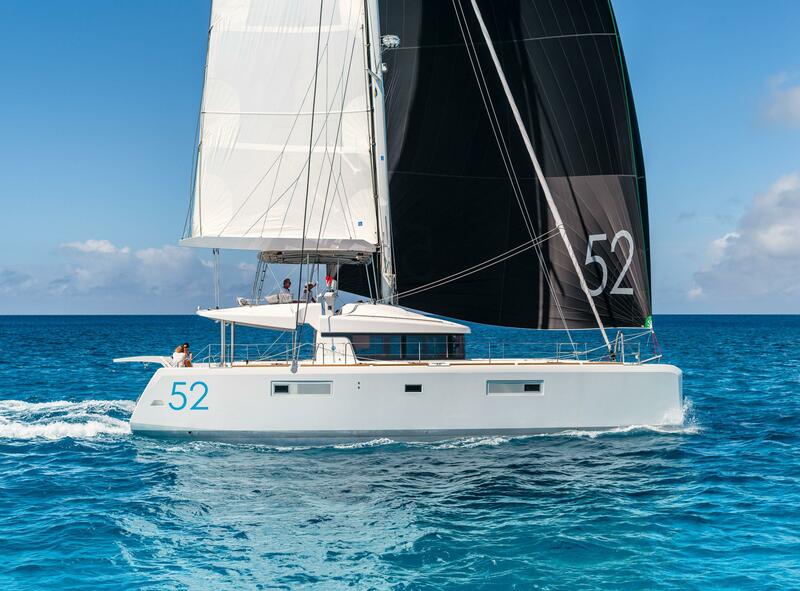 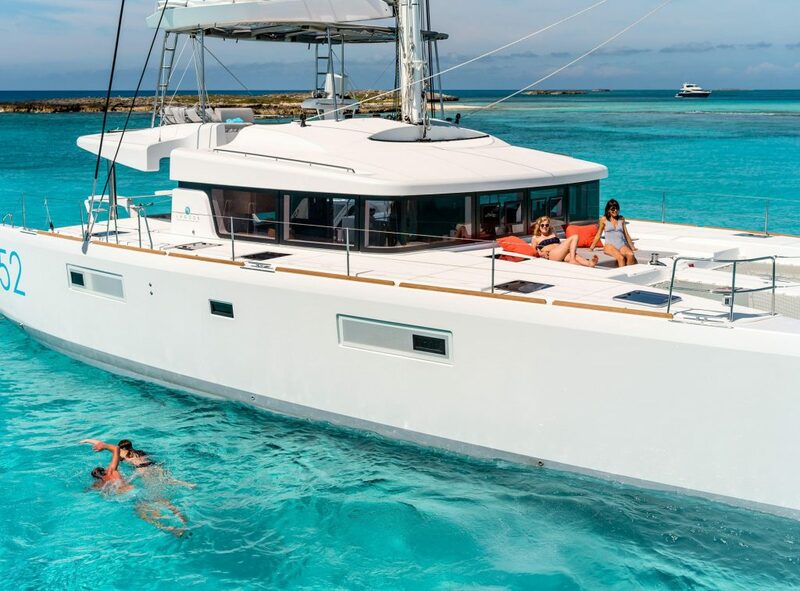 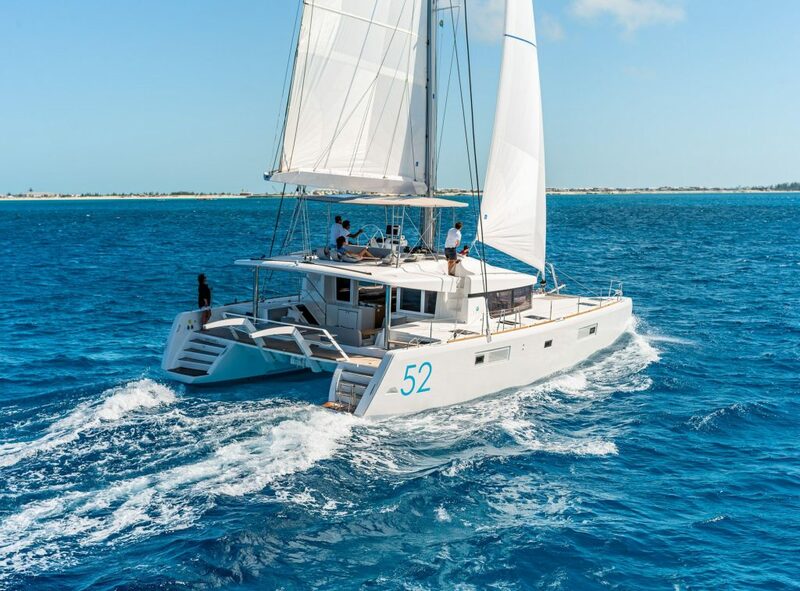 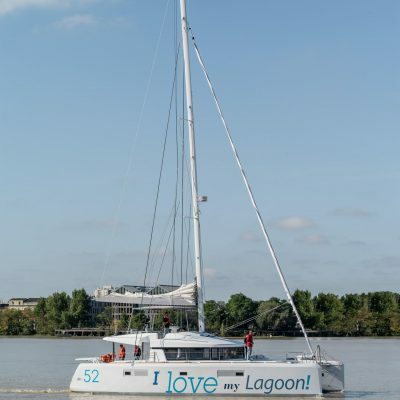 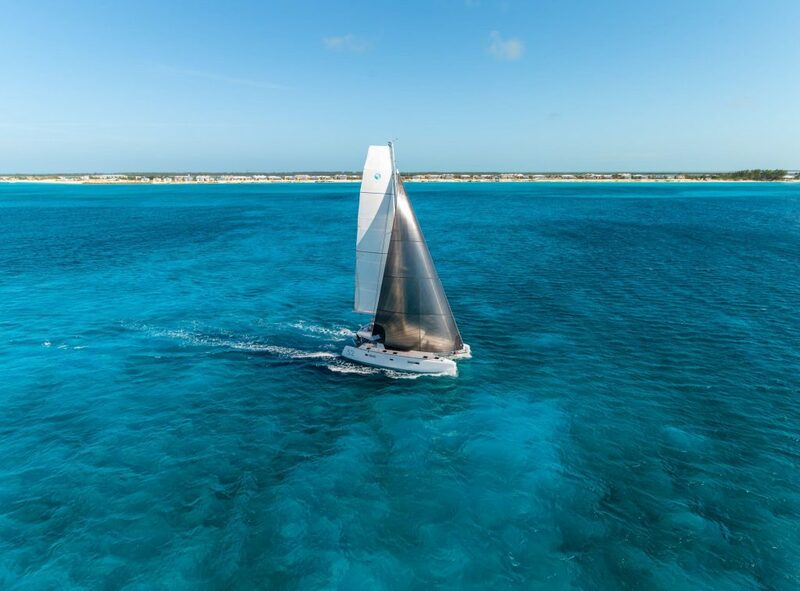 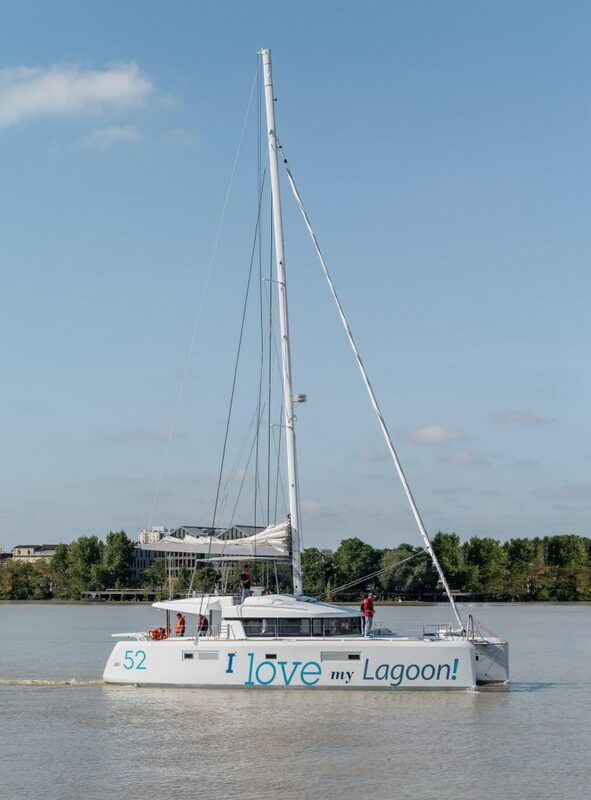 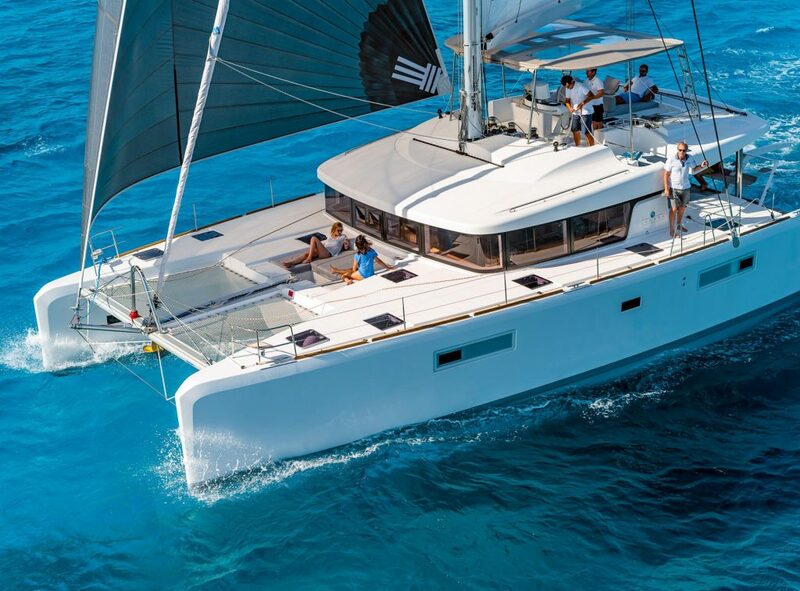 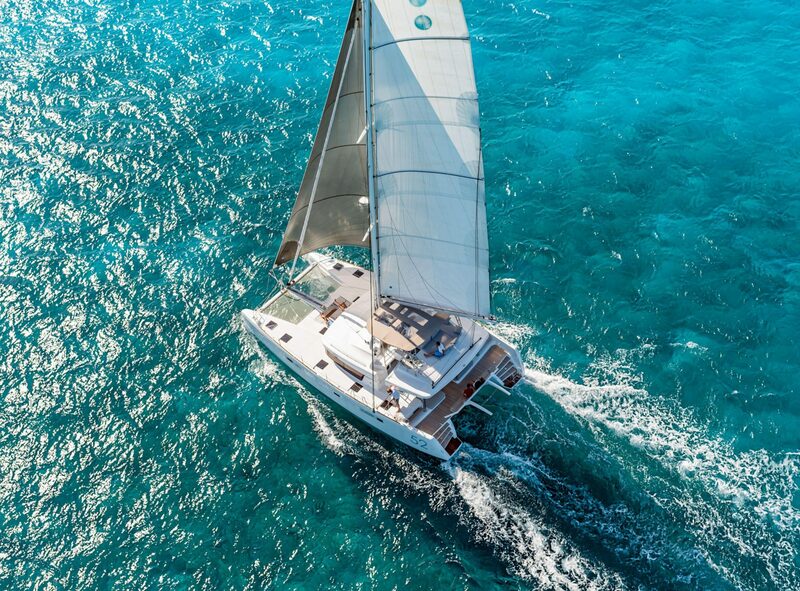 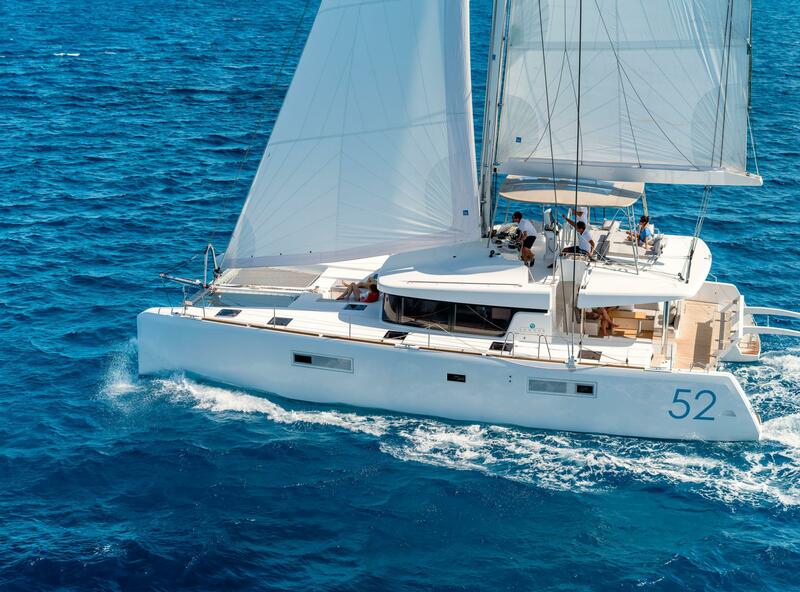 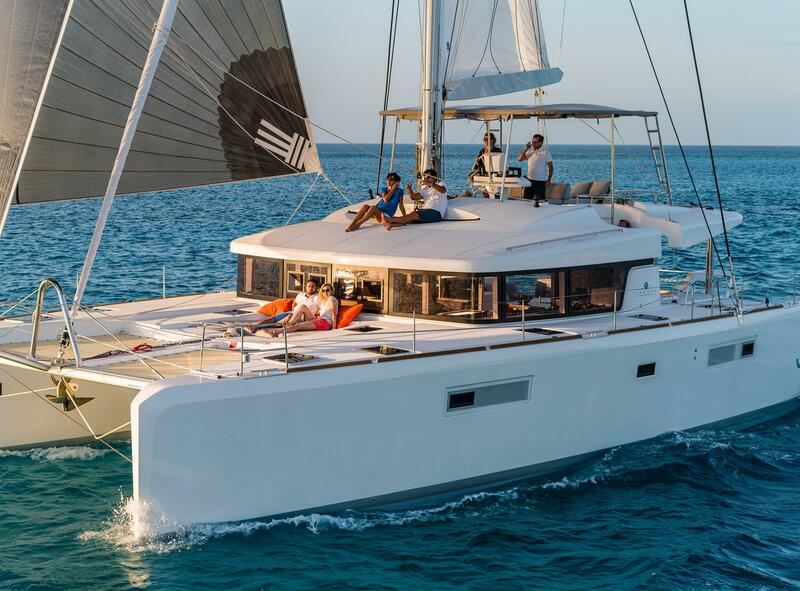 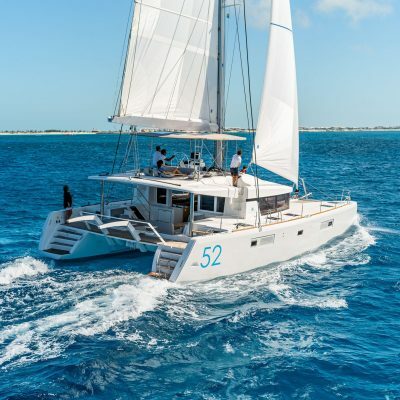 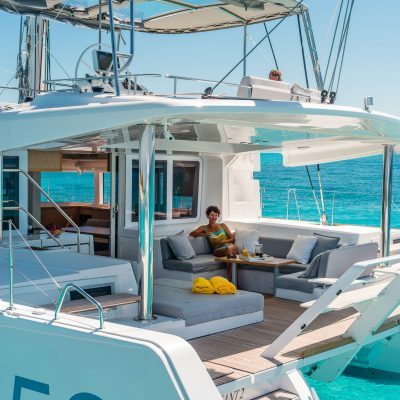 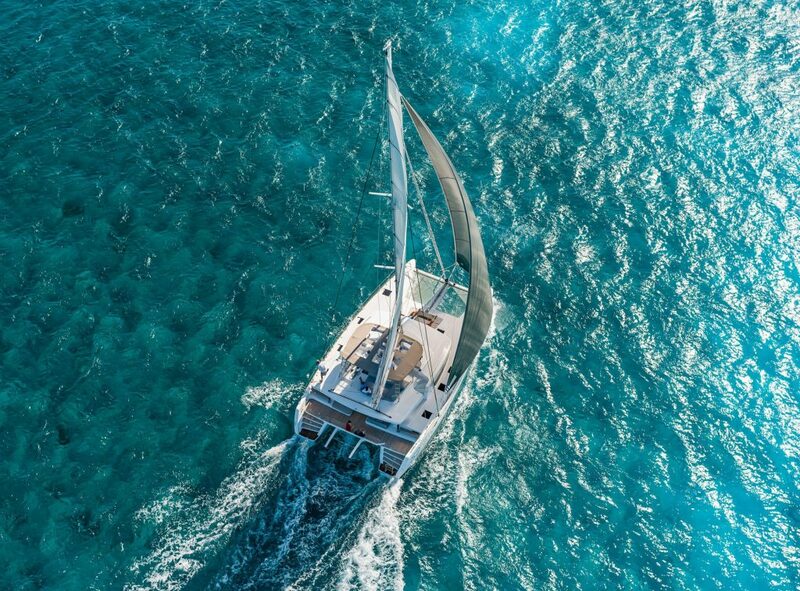 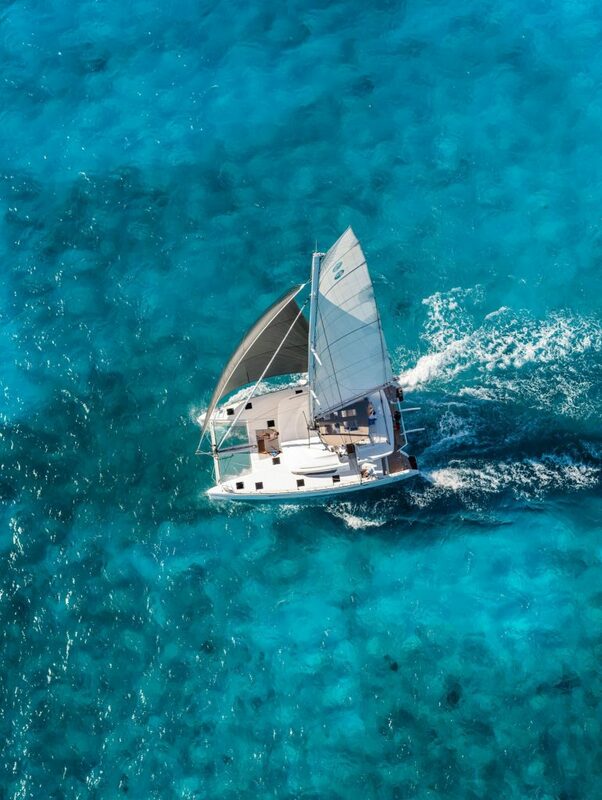 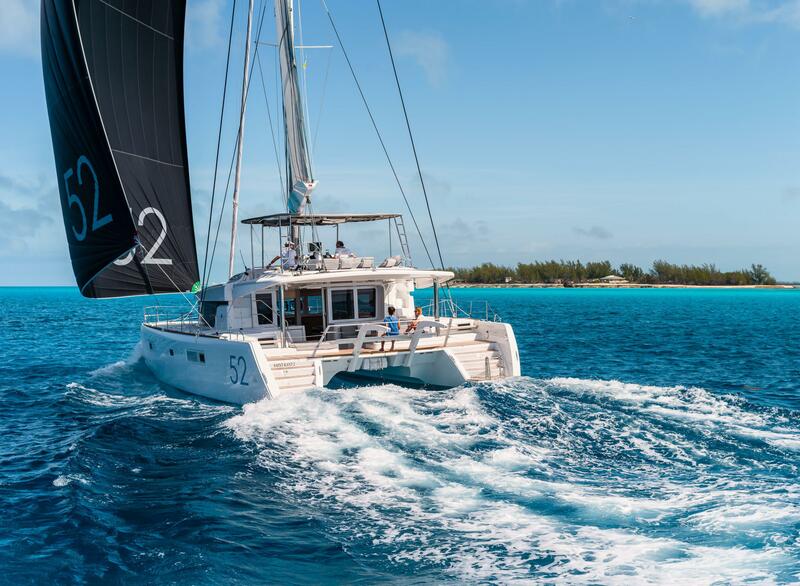 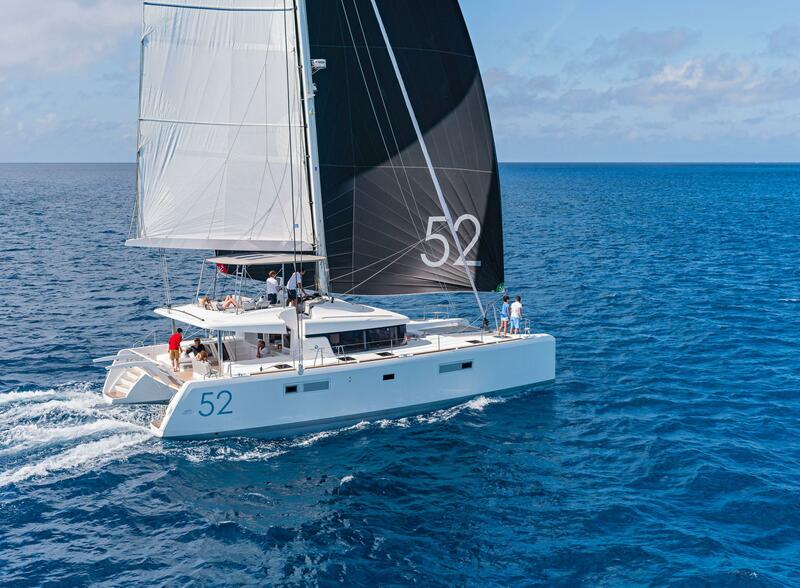 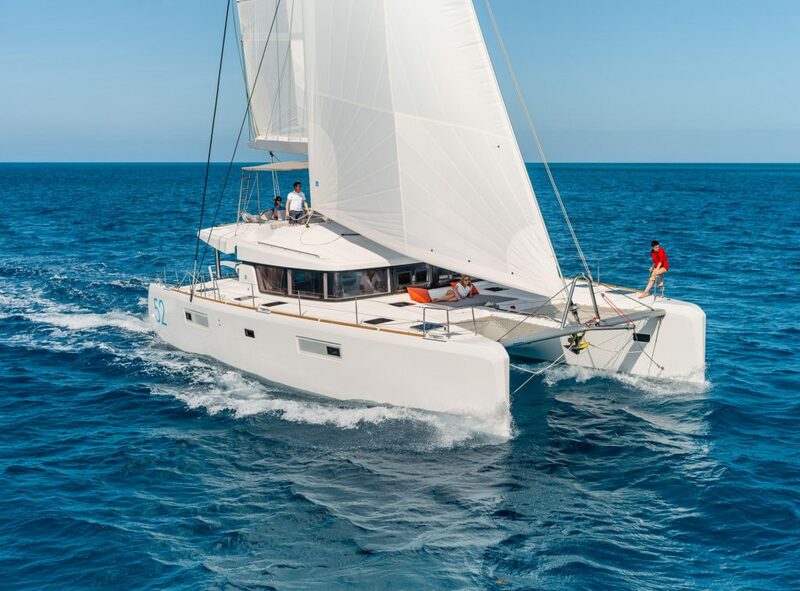 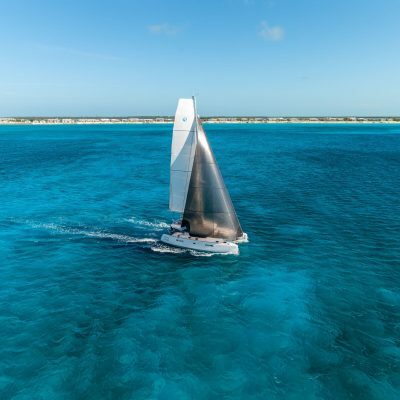 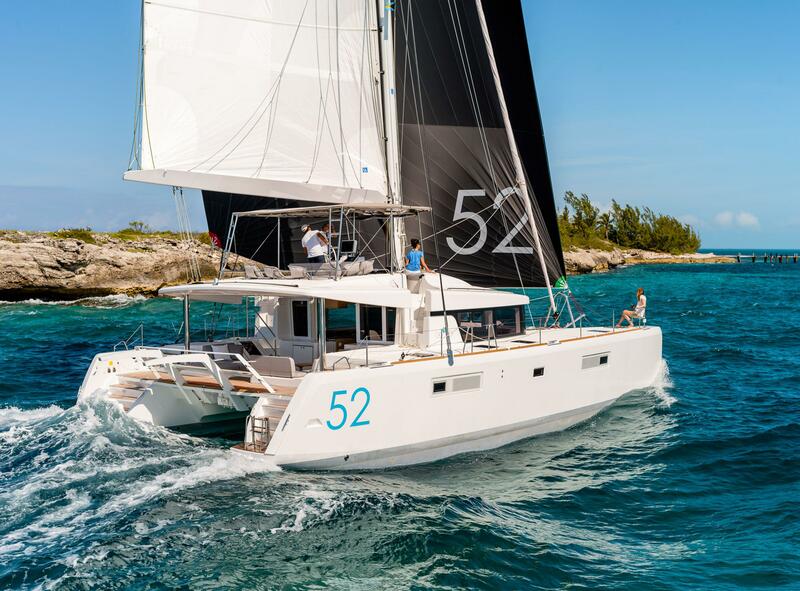 The Lagoon 52 is constructed using anti-osmotic and polyester resins, with an infused balsa-core sandwich in the decks and the topsides of the hulls; below the waterline, the layup is infused solid glass. 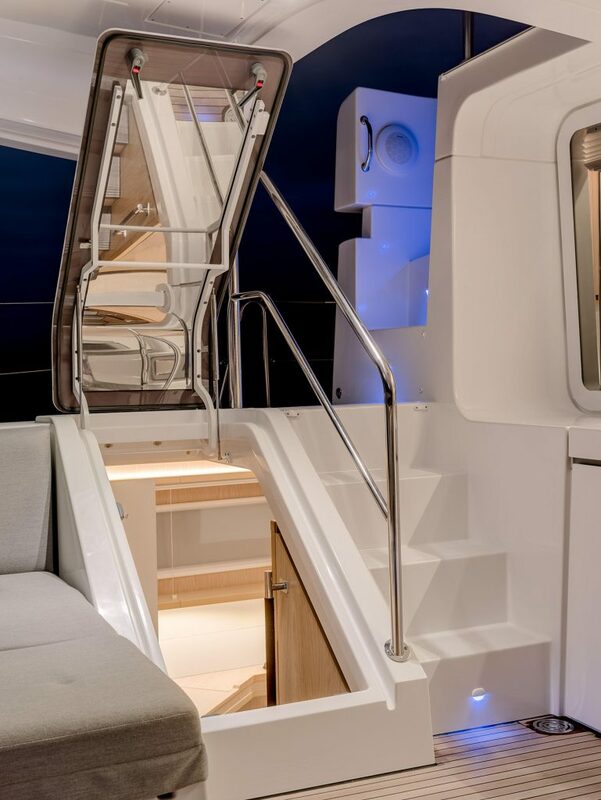 This saves weight, thus aiding performance, above the waterline and maintains strength and solidity below.